There will be a Type object created for 'int'. Since int is canonical, its CanonicalType pointer points to itself. There is also a Type for 'foo' (a TypedefType). Its CanonicalType pointer points to the 'int' Type. Next there is a PointerType that represents 'int*', which, like 'int', is canonical. Finally, there is a PointerType type for 'foo*' whose canonical type is 'int*', and there is a TypedefType for 'bar', whose canonical type is also 'int*'. Non-canonical types are useful for emitting diagnostics, without losing information about typedefs being used. Canonical types are useful for type comparisons (they allow by-pointer equality tests) and useful for reasoning about whether something has a particular form (e.g. is a function type), because they implicitly, recursively, strip all typedefs out of a type. Types, once created, are immutable. Definition at line 1414 of file Type.h. Definition at line 1598 of file Type.h. Definition at line 2070 of file Type.h. Definition at line 1416 of file Type.h. Definition at line 1777 of file Type.h. Referenced by clang::TemplateSpecializationType::anyDependentTemplateArguments(), clang::CodeGen::CGDebugInfo::finalize(), clang::TemplateTypeParmType::getIdentifier(), getNullability(), and isObjCClassOrClassKindOfType(). Determines if this is an ObjC interface type that may accept type parameters. Definition at line 1471 of file Type.cpp. Determines whether this type can decay to a pointer type. Definition at line 6695 of file Type.h. Determine whether the given type can have a nullability specifier applied to it, i.e., if it is any kind of pointer type. ResultIfUnknown The value to return if we don't yet know whether this type can have nullability because it is dependent. Definition at line 3788 of file Type.cpp. References clang::Auto, getCanonicalTypeInternal(), getKind(), getTypeClass(), and clang::QualType::getTypePtr(). Referenced by checkNullabilityTypeSpecifier(), processTypeAttrs(), and clang::TreeTransform< Derived >::TransformDependentTemplateSpecializationType(). Look through sugar for the underlying instance of <specific type>. This method has the same relationship to getAs<T> as cast<T> has to dyn_cast<T>; which is to say, the underlying type must have the intended type, and this method will never return null. Definition at line 6831 of file Type.h. Referenced by clang::Sema::adjustCCAndNoReturn(), clang::ASTContext::adjustDeducedFunctionResultType(), clang::ASTContext::applyObjCProtocolQualifiers(), clang::ASTContext::areCommonBaseCompatible(), clang::Sema::BuildMemberReferenceExpr(), clang::ASTContext::canAssignObjCInterfaces(), clang::canCalleeThrow(), clang::CapturedStmt::Capture::Capture(), checkConditionalPointerCompatibility(), CheckConstantExpression(), CheckConstexprCtorInitializer(), clang::Sema::CheckEquivalentExceptionSpec(), clang::Sema::CheckExplicitlyDefaultedMemberExceptionSpec(), clang::Sema::CheckFunctionTemplateSpecialization(), clang::Sema::checkInitMethod(), clang::Sema::CheckMain(), clang::Sema::CheckMemberOperatorAccess(), clang::Sema::CheckMSVCRTEntryPoint(), clang::Sema::checkOpenCLDisabledTypeDeclSpec(), clang::Sema::CheckOverridingFunctionExceptionSpec(), clang::Sema::CheckTransparentUnionArgumentConstraints(), clang::Sema::CodeCompleteCase(), commonEmitCXXMemberOrOperatorCall(), clang::CodeGen::CGDebugInfo::completeClass(), completeFunctionType(), clang::CodeGen::CGDebugInfo::completeType(), clang::CodeGen::CGDebugInfo::completeUnusedClass(), clang::ObjCObjectType::computeSuperClassTypeSlow(), convertToComplexValue(), createBinOpInfoFromIncDec(), decomposeTypeForEH(), clang::Sema::DeduceReturnType(), clang::Sema::DefineImplicitCopyAssignment(), clang::Sema::DefineImplicitCopyConstructor(), clang::Sema::DefineImplicitDefaultConstructor(), clang::Sema::DefineImplicitDestructor(), clang::Sema::DefineImplicitMoveAssignment(), clang::Sema::DefineImplicitMoveConstructor(), clang::Sema::DefineInheritingConstructor(), DiagnoseCallingConvCast(), clang::Sema::DiagnoseSentinelCalls(), clang::CodeGen::CodeGenFunction::EmitArraySubscriptExpr(), emitCombinerOrInitializer(), clang::CodeGen::CodeGenFunction::EmitCXXConstructorCall(), clang::CodeGen::CodeGenFunction::EmitCXXMemberOrOperatorCall(), clang::CodeGen::CodeGenFunction::EmitCXXMemberPointerCallExpr(), clang::CodeGen::CodeGenFunction::EmitCXXNewExpr(), emitDeclTargetLinkVarDeclLValue(), emitDestructorsFunction(), clang::CodeGen::CodeGenFunction::EmitDynamicCast(), clang::CodeGen::CodeGenFunction::EmitForwardingCallToLambda(), clang::CodeGen::CGDebugInfo::EmitGlobalVariable(), clang::CodeGen::CodeGenModule::EmitNullConstant(), emitOutlinedFunctionPrologue(), emitParallelOrTeamsOutlinedFunction(), emitPointerArithmetic(), emitProxyTaskFunction(), clang::CodeGen::CodeGenFunction::EmitSynthesizedCXXCopyCtorCall(), emitTaskDupFunction(), emitTaskPrivateMappingFunction(), clang::CodeGen::CodeGenFunction::EmitUnaryOpLValue(), emitWritebackArg(), EvalAndBitcastToAPInt(), EvaluateComparisonBinaryOperator(), EvaluateComplex(), clang::Sema::EvaluateImplicitExceptionSpec(), evaluateLValueAsAllocSize(), EvaluateMemberPointer(), EvaluatePointer(), EvaluateTemporary(), EvaluateVector(), clang::exceptionSpecNotKnownYet(), clang::CXXRecordDecl::FindBaseClass(), clang::Expr::findBoundMemberType(), FindDesignatorMismatch(), clang::CXXRecordDecl::FindNestedNameSpecifierMember(), clang::CXXRecordDecl::FindOMPMapperMember(), clang::CXXRecordDecl::FindOMPReductionMember(), clang::CXXRecordDecl::FindOrdinaryMember(), findPeephole(), clang::CXXRecordDecl::FindTagMember(), clang::CXXRecordDecl::FindVirtualBaseClass(), GetAlignOfExpr(), clang::Expr::getBestDynamicClassType(), getCallingConvMangling(), clang::FunctionDecl::getCallResultType(), clang::CallExpr::getCallReturnType(), getCXXRecord(), clang::FunctionDecl::getDeclaredReturnType(), clang::CXXMethodDecl::getDevirtualizedMethod(), getFieldSize(), clang::BlockExpr::getFunctionType(), clang::ObjCObjectPointerType::getInterfaceType(), getObjCSubstitutions(), clang::ObjCObjectPointerType::getObjectType(), clang::getParameterABISpelling(), clang::ReferenceType::getPointeeType(), clang::FunctionDecl::getReturnType(), clang::ObjCInterfaceDecl::getSuperClassType(), clang::CastExpr::getTargetFieldForToUnionCast(), clang::CodeGen::CodeGenFunction::GetUndefRValue(), getUsualDeleteParams(), clang::AtomicExpr::getValueType(), handleCompoundAssignment(), HandleConstructorCall(), hasDeducedReturnType(), hasDefaultCXXMethodCC(), clang::Sema::InstantiateExceptionSpec(), clang::TemplateDeclInstantiator::InstantiateTypedefNameDecl(), clang::CXXDynamicCastExpr::isAlwaysNull(), isDesignatorAtObjectEnd(), isIdiomaticBraceElisionEntity(), isNoexcept(), clang::QualType::isNonWeakInMRRWithObjCWeak(), clang::Sema::isOpenMPCapturedByRef(), clang::CodeGen::CodeGenModule::isPaddedAtomicType(), isRecordEmpty(), clang::FunctionDecl::isReplaceableGlobalAllocationFunction(), clang::FunctionDecl::isReservedGlobalPlacementOperator(), isSimpleZero(), isStructEmpty(), isTemplate(), clang::Sema::LookupMethodInObjectType(), LookupMethodInReceiverType(), clang::MangleContext::mangleName(), mangleThunkThisAdjustment(), ObjCEncodingForEnumType(), clang::Sema::PerformImplicitConversion(), clang::Sema::prepareVectorSplat(), clang::Sema::ResolveExceptionSpec(), shouldEmitVTableThunk(), clang::Sema::startLambdaDefinition(), clang::ObjCObjectPointerType::stripObjCKindOfTypeAndQuals(), clang::TreeTransform< Derived >::TransformDependentTemplateSpecializationType(), and clang::ASTDeclReader::VisitFunctionDecl(). A variant of castAs<> for array type which silently discards qualifiers from the outermost type. Definition at line 6840 of file Type.h. Referenced by CheckConstantExpression(), clang::CodeGen::CodeGenFunction::EmitArrayToPointerDecay(), clang::CodeGen::CGOpenMPRuntimeNVPTX::emitTeamsOutlinedFunction(), FindDesignatorMismatch(), getArrayIndexingBound(), clang::OMPArraySectionExpr::getBaseOriginalType(), clang::QualType::getBaseTypeIdentifier(), getCoreType(), and isFlexibleArrayMemberExpr(). Whether this type is or contains an unexpanded parameter pack, used to support C++0x variadic templates. typedef T* pointer_types; // ill-formed; T is a parameter pack. Definition at line 1840 of file Type.h. Referenced by clang::Sema::BuildBaseInitializer(), buildDeclareReductionRef(), buildUserDefinedMapperRef(), clang::Sema::CheckBaseSpecifier(), clang::Sema::CheckPackExpansion(), clang::NestedNameSpecifier::containsUnexpandedParameterPack(), clang::Sema::containsUnexpandedParameterPacks(), clang::ExprWithCleanups::Create(), clang::OffsetOfExpr::CreateEmpty(), clang::DeducedType::DeducedType(), clang::Sema::DiagnoseUnexpandedParameterPack(), clang::CXXScalarValueInitExpr::getBeginLoc(), clang::FunctionType::getNameForCallConv(), clang::ASTContext::getPackExpansionType(), clang::ObjCPropertyRefExpr::getReceiverType(), hasOnlyNonStaticMemberFunctions(), clang::DependentSizedArrayType::Profile(), clang::DependentSizedExtVectorType::Profile(), clang::DependentVectorType::Profile(), clang::MaterializeTemporaryExpr::setExtendingDecl(), clang::Sema::SubstParmVarDecl(), clang::TreeTransform< Derived >::TransformFunctionTypeParams(), clang::TreeTransform< Derived >::TransformOverloadExprDecls(), and clang::TextNodeDumper::Visit(). Definition at line 213 of file ASTDumper.cpp. Definition at line 215 of file ASTDumper.cpp. If this is an array type, return the element type of the array, potentially with type qualifiers missing. getArrayElementTypeNoTypeQual - If this is an array type, return the element type of the array, potentially with type qualifiers missing. This should never be used when type qualifiers are meaningful. This method should never be used when type qualifiers are meaningful. Definition at line 261 of file Type.cpp. References clang::VectorType::desugar(), clang::QualType::getDesugaredType(), clang::VectorType::getElementType(), getLocallyUnqualifiedSingleStepDesugaredType(), clang::ASTContext::getQualifiedType(), clang::QualType::getTypePtr(), getUnqualifiedDesugaredType(), clang::SplitQualType::Quals, clang::QualType::split(), and clang::SplitQualType::Ty. Referenced by checkNullabilityTypeSpecifier(), and evenFlexibleArraySize(). Look through sugar for an instance of <specific type>. This scheme will eventually replace the specific getAsXXXX methods above. There are some specializations of this member template listed immediately following this class. Definition at line 6768 of file Type.h. Referenced by clang::Sema::ActOnCompatibilityAlias(), clang::Sema::ActOnCXXDelete(), clang::Sema::ActOnDependentMemberExpr(), clang::Sema::ActOnFinishFunctionBody(), clang::Sema::ActOnObjCAtSynchronizedOperand(), clang::Sema::ActOnStartCXXMemberReference(), clang::Sema::ActOnTypedefedProtocols(), addBaseAndFieldSizes(), AddClassMessageCompletions(), AddFunctionParameterChunks(), AddFunctionTypeQualsToCompletionString(), clang::Sema::AddMethodCandidate(), clang::Sema::AddOverloadCandidate(), clang::CodeGen::swiftcall::SwiftAggLowering::addTypedData(), clang::Sema::adjustCCAndNoReturn(), AdjustFunctionParmAndArgTypesForDeduction(), AnalyzeBitFieldAssignment(), AnalyzeCompoundAssignment(), appendFunctionType(), appendType(), clang::ASTContext::areComparableObjCPointerTypes(), clang::ASTContext::areCompatibleVectorTypes(), assignInheritanceModel(), assumeNoOverflow(), clang::ASTDeclReader::attachPreviousDeclImpl(), breakDownVectorType(), clang::CodeGen::CodeGenFunction::BuildAppleKextVirtualCall(), clang::Sema::BuildCXXTypeId(), clang::Sema::BuildDeclarationNameExpr(), buildDeclareReductionRef(), clang::Sema::BuildExpressionFromIntegralTemplateArgument(), clang::Sema::BuildMemberReferenceExpr(), buildMemcpyForAssignmentOp(), clang::Sema::BuildObjCAtThrowStmt(), clang::Sema::BuildObjCExceptionDecl(), clang::Sema::BuildQualifiedType(), buildSingleCopyAssignRecursively(), clang::Sema::BuildTypeofExprType(), clang::Sema::BuildUnaryTransformType(), BuildUniqueMethodName(), clang::Sema::BuildVectorLiteral(), clang::Sema::ImplicitExceptionSpecification::CalledDecl(), clang::arcmt::trans::canApplyWeak(), canAssignObjCObjectTypes(), clang::canCalleeThrow(), clang::Sema::canThrow(), CanThrow(), clang::canTypeidThrow(), CanUseSingleInheritance(), checkArithmeticBinOpPointerOperands(), checkArithmeticIncompletePointerType(), checkArithmeticOpPointerOperand(), checkArithmeticOrEnumeralThreeWayCompare(), CheckArrow(), CheckASTMemory(), clang::Sema::CheckBaseClassAccess(), checkBuiltinArgument(), clang::Sema::CheckCastAlign(), clang::Sema::CheckCompatibleReinterpretCast(), checkConditionalObjectPointersCompatibility(), clang::Sema::CheckConditionalOperands(), checkConditionalPointerCompatibility(), CheckConstantExpression(), CheckConstexprParameterTypes(), clang::Sema::CheckConstructorDeclarator(), clang::Sema::CheckConversionDeclarator(), CheckCXX98CompatAccessibleCopy(), clang::Sema::CheckCXXThrowOperand(), clang::Sema::CheckDestructorDeclarator(), clang::Sema::CheckDistantExceptionSpec(), checkEnumComparison(), clang::Sema::CheckEnumUnderlyingType(), clang::Sema::CheckEquivalentExceptionSpec(), clang::Sema::CheckExceptionSpecSubset(), clang::Sema::CheckExplicitlyDefaultedSpecialMember(), CheckFallThroughForBody(), checkFormatStringExpr(), checkFoundationAPI(), clang::Sema::CheckFriendTypeDecl(), CheckIdentityFieldAssignment(), clang::Sema::checkIllFormedTrivialABIStruct(), CheckImplicitConversion(), CheckIncrementDecrementOperand(), CheckIndirectionOperand(), CheckKeyForObjCARCConversion(), checkLiteralOperatorTemplateParameterList(), CheckMemaccessSize(), clang::Sema::CheckMemberPointerConversion(), clang::Sema::CheckMessageArgumentTypes(), CheckNonNullArguments(), checkNullabilityTypeSpecifier(), checkObjCArrayLiteral(), checkObjCCollectionLiteralElement(), clang::Sema::CheckObjCConversion(), checkObjCDictionaryLiteral(), clang::Sema::CheckObjCForCollectionOperand(), checkObjCKindOfType(), checkObjCPointerTypesForAssignment(), checkOpenCLConditionVector(), checkOpenCLEnqueueVariadicArgs(), checkOpenCLPipePacketType(), CheckOperatorNewDeleteTypes(), clang::Sema::CheckOverloadedOperatorDeclaration(), clang::Sema::CheckOverridingFunctionAttributes(), clang::Sema::CheckOverridingFunctionExceptionSpec(), clang::Sema::CheckOverridingFunctionReturnType(), clang::Sema::CheckPointerToMemberOperands(), clang::Sema::CheckSingleAssignmentConstraints(), clang::Sema::CheckSpecifiedExceptionType(), clang::Sema::CheckSubscriptingKind(), CheckTautologicalComparison(), CheckTemplateArgumentIsCompatibleWithParameter(), clang::Sema::CheckUnaryExprOrTypeTraitOperand(), clang::Sema::CheckUnresolvedMemberAccess(), checkVAStartABI(), checkVAStartIsInVariadicFunction(), clang::Sema::CheckVectorCompareOperands(), clang::Sema::CheckVectorLogicalOperands(), clang::Sema::CheckVectorOperands(), checkVectorResult(), checkVectorShift(), ClassifyDiagnostic(), classifyPointerDeclarator(), classifyReturnType(), classifyTypeForARCConversion(), ClassifyUnnamed(), clang::Sema::CodeCompleteMemberReferenceExpr(), CompareDerivedToBaseConversions(), CompareStandardConversionSequences(), clang::Sema::CompleteConstructorCall(), clang::CodeGen::CGDebugInfo::completeUnusedClass(), clang::Sema::computeDeclContext(), clang::CodeGen::CodeGenModule::computeNonVirtualBaseClassOffset(), ComputeVMIClassTypeInfoFlags(), clang::CodeGen::CodeGenModule::ConstructAttributeList(), clang::Sema::ConversionToObjCStringLiteralCheck(), convertVector(), CopyObject(), create_dispatch_once(), create_OSAtomicCompareAndSwap(), createBinOpInfoFromIncDec(), clang::Sema::CreateBuiltinArraySubscriptExpr(), CreateNewFunctionDecl(), clang::Sema::CreateUnaryExprOrTypeTraitExpr(), CXXRecordMembersNamed(), decomposeTypeForEH(), clang::Sema::DeduceAutoType(), clang::Sema::DeduceFunctionTypeFromReturnExpr(), clang::Sema::DeduceReturnType(), clang::Sema::DeduceTemplateArguments(), DeduceTemplateArgumentsByTypeMatch(), clang::Sema::DefaultArgumentPromotion(), defaultedSpecialMemberIsConstexpr(), clang::Sema::DefineImplicitCopyAssignment(), dereference(), clang::Sema::DiagnoseAssignmentEnum(), DiagnoseBadFunctionCast(), DiagnoseCastOfObjCSEL(), diagnoseListInit(), DiagnoseNarrowingInInitList(), clang::Sema::DiagnosePropertyAccessorMismatch(), DiagnoseRecursiveConstFields(), DiagnoseSelfAssignment(), clang::Sema::DiagnoseSentinelCalls(), diagReturnOnAllocFailure(), doesUsualArrayDeleteWantSize(), doRewriteToUTF8StringBoxedExpressionHelper(), dumpBasePath(), dumpRecord(), DumpRecordLayout(), clang::CodeGen::CodeGenFunction::EmitAggregateCopy(), clang::CodeGen::CodeGenFunction::EmitArraySubscriptExpr(), clang::CodeGen::CodeGenFunction::EmitAtomicExpr(), clang::CodeGen::CodeGenFunction::EmitAutoVarAlloca(), EmitBaseInitializer(), clang::CodeGen::CodeGenFunction::EmitBlockCallExpr(), clang::CodeGen::CodeGenFunction::EmitCallAndReturnForThunk(), clang::CodeGen::CodeGenFunction::EmitCallArg(), clang::CodeGen::CodeGenFunction::EmitCallee(), clang::CodeGen::CodeGenFunction::EmitCastLValue(), EmitCompare(), clang::CodeGen::CodeGenFunction::EmitComplexPrePostIncDec(), clang::CodeGen::CodeGenFunction::EmitCXXMemberPointerCallExpr(), clang::CodeGen::CodeGenFunction::EmitCXXPseudoDestructorExpr(), clang::CodeGen::CodeGenFunction::EmitDeleteCall(), clang::CodeGen::CodeGenFunction::EmitDynamicCast(), clang::CodeGen::CodeGenFunction::EmitEndEHSpec(), clang::CodeGen::CodeGenFunction::EmitExtVectorElementExpr(), clang::CodeGen::CodeGenFunction::EmitExtVectorElementLValue(), clang::CodeGen::ConstantEmitter::emitForMemory(), EmitFunctionDeclPointer(), clang::CodeGen::CodeGenFunction::EmitLoadOfExtVectorElementLValue(), clang::CodeGen::CGCXXABI::EmitLoadOfMemberFunctionPointer(), clang::CodeGen::CodeGenFunction::EmitLValue(), clang::CodeGen::CodeGenModule::EmitNullConstant(), clang::CodeGen::CodeGenFunction::EmitNullInitialization(), clang::CodeGen::CodeGenFunction::EmitNVPTXDevicePrintfCallExpr(), clang::CodeGen::CodeGenFunction::EmitObjCMessageExpr(), EmitObjectDelete(), clang::CodeGen::CodeGenFunction::EmitParmDecl(), emitPointerArithmetic(), clang::CodeGen::CodeGenFunction::EmitPointerToDataMemberBinaryExpr(), clang::CodeGen::CodeGenFunction::EmitScalarRangeCheck(), clang::CodeGen::CodeGenFunction::EmitStartEHSpec(), clang::CodeGen::CodeGenFunction::EmitStoreThroughExtVectorComponentLValue(), clang::CodeGen::CGDebugInfo::EmitUsingDecl(), clang::CodeGen::CodeGenFunction::EmitVTablePtrCheckForCast(), EmitX86_64VAArgFromMemory(), EvaluateBinaryTypeTrait(), EvaluateComparisonBinaryOperator(), EvaluateComplex(), clang::CodeGen::CodeGenFunction::EvaluateExprAsBool(), EvaluateUnaryTypeTrait(), EvaluateVector(), evenFlexibleArraySize(), extractPBaseFlags(), clang::Sema::ExtractUnqualifiedFunctionType(), FieldHasTrivialDestructorBody(), clang::Sema::FindAllocationFunctions(), clang::Sema::FindCompositePointerType(), FindConversionForRefInit(), findEnumForBlockReturn(), findMethodDecl(), clang::CXXRecordDecl::FindOrdinaryMemberInDependentClasses(), clang::analyze_printf::PrintfSpecifier::fixType(), clang::analyze_scanf::ScanfSpecifier::fixType(), clang::CXXRecordDecl::forallBases(), GeneralizeFunctionType(), clang::CodeGen::CodeGenFunction::GenerateVarArgsThunk(), getAccessFlag(), GetAlignOfType(), clang::CXXNewExpr::getAllocatedType(), clang::TypedefNameDecl::getAnonDeclWithTypedefName(), getArrayIndexingBound(), GetAssumedMessageSendExprType(), getBadTypeidFn(), GetBaseType(), clang::QualType::getBaseTypeIdentifier(), clang::Expr::getBestDynamicClassType(), getBlockLayoutInfoString(), clang::Sema::getCallingConvAttributedType(), clang::CallExpr::getCallReturnType(), clang::ASTContext::getCanonicalNestedNameSpecifier(), getCanonicalTypeInternal(), getCastAwayConstnessCastKind(), clang::ASTContext::getCommentForDecl(), clang::CXXConversionDecl::getConversionType(), clang::CXXMethodDecl::getCorrespondingMethodInClass(), clang::ASTContext::getCorrespondingSaturatedType(), clang::ASTContext::getCorrespondingSignedFixedPointType(), clang::ASTContext::getCorrespondingUnsignedType(), getCXXRecord(), clang::ento::MemRegionManager::getCXXThisRegion(), clang::ASTContext::getDeclAlign(), clang::ento::CallEvent::getDeclaredResultType(), clang::getDeclUsageType(), clang::CXXDeleteExpr::getDestroyedType(), clang::CFGImplicitDtor::getDestructorDecl(), GetExprType(), clang::ASTContext::getFixedPointIBits(), GetFixedPointRank(), clang::ASTContext::getFixedPointScale(), getFloatingRank(), clang::ASTContext::getFloatTypeSemantics(), clang::Sema::getFullyPackExpandedSize(), clang::TypeName::getFullyQualifiedNestedNameSpecifier(), clang::getFunctionExtInfo(), clang::CodeCompleteConsumer::OverloadCandidate::getFunctionType(), clang::Decl::getFunctionType(), clang::CodeGen::CodeGenTypes::GetFunctionTypeForVTable(), clang::ASTContext::getFunctionTypeWithExceptionSpec(), GetGCAttrTypeForType(), getIncrementedVar(), clang::ASTContext::getInnerObjCOwnership(), clang::ObjCObjectType::getInterface(), GetIntrinsic(), clang::ASTContext::getIntWidth(), clang::ASTContext::getLegacyIntegralTypeEncoding(), getLocallyUnqualifiedSingleStepDesugaredType(), clang::ento::TypedValueRegion::getLocationType(), clang::ASTContext::getLValueReferenceType(), getMaxAtomicAccessSize(), getMostInformativeDerivedClassImpl(), clang::UnresolvedMemberExpr::getNamingClass(), clang::StandardConversionSequence::getNarrowingKind(), clang::CodeGen::CodeGenFunction::getNaturalTypeAlignment(), getNonMemoryType(), getNonNullAttrs(), clang::NSAPI::GetNSIntegralKind(), clang::NSAPI::getNSNumberFactoryMethodKind(), getNullability(), clang::ento::getNullabilityAnnotation(), GetNumNonZeroBytesInInit(), clang::OverloadCandidate::getNumParams(), clang::FunctionDecl::getNumParams(), getObjCBridgeAttr(), clang::ASTContext::getObjCGCAttrKind(), clang::ASTContext::getObjCGCQualType(), clang::ASTContext::getObjCObjectType(), clang::TemplateArgument::getPackExpansionPattern(), clang::getParameterABISpelling(), clang::CodeGen::CGOpenCLRuntime::getPipeElemAlign(), clang::CodeGen::CGOpenCLRuntime::getPipeElemSize(), getPointeeCXXRecordDecl(), clang::ASTContext::getPreferredTypeAlign(), getPrettyTypeName(), clang::ASTContext::getPromotedIntegerType(), getRangeForType(), clang::ObjCMessageExpr::getReceiverInterface(), getRecordArgABI(), GetReturnType(), getReturnTypeForMethod(), clang::ASTContext::getRValueReferenceType(), clang::Sema::GetSignedVectorType(), getThrowFn(), clang::ASTContext::getTypeAlignIfKnown(), getTypeExpansion(), getTypeForFormat(), clang::ASTContext::getTypeInfoDataSizeInChars(), getTypeString(), clang::ASTContext::getTypeUnadjustedAlign(), clang::GetUnderlyingFunction(), getUsualDeleteParams(), clang::Expr::getValueKindForType(), clang::AtomicExpr::getValueType(), clang::ento::MemRegionManager::getVarRegion(), clang::CodeGen::CodeGenTBAA::getVTablePtrAccessInfo(), GetX86_64ByValArgumentPair(), handleAssignment(), HandleBaseToDerivedCast(), handleCompoundAssignment(), HandleConstructorCall(), clang::Sema::HandleFunctionTypeMismatch(), HandleMemberPointerAccess(), handleObjCOwnershipTypeAttr(), HandleOpenCLAccessAttr(), clang::Sema::handlerCanCatch(), hasAttr(), hasBooleanRepresentation(), clang::RecordType::hasConstFields(), hasDefaultCXXMethodCC(), hasDefaultSetterName(), hasDefinition(), clang::hasImplicitExceptionSpec(), hasIsEqualMethod(), hasMangledSubstitutionQualifiers(), HasNonDllImportDtor(), HasNoThrowOperator(), hasSizedVLAType(), clang::ASTContext::hasUniqueObjectRepresentations(), clang::CodeGen::CodeGenFunction::hasVolatileMember(), hasWeakMember(), clang::Sema::IgnoredValueConversions(), clang::Sema::inferCUDATargetForImplicitSpecialMember(), clang::TemplateDeclInstantiator::InitFunctionInstantiation(), clang::TemplateDeclInstantiator::InstantiateTypedefNameDecl(), is32Or64BitBasicType(), IsAddressSpaceConversion(), clang::CXXDynamicCastExpr::isAlwaysNull(), isArithmeticArgumentPromotion(), isAtLeastAsSpecializedAs(), clang::Sema::IsBlockPointerConversion(), isBooleanType(), isCanonicalExceptionSpecification(), IsCFError(), isCFStringType(), isCharSpecialization(), clang::ento::cocoa::isCocoaObjectRef(), clang::Sema::IsComplexPromotion(), clang::Expr::isConstantInitializer(), clang::CodeGen::CodeGenFunction::IsConstructorDelegationValid(), clang::CXXMethodDecl::isCopyAssignmentOperator(), clang::CXXConstructorDecl::isCopyOrMoveConstructor(), clang::QualType::isCXX11PODType(), IsDerivedFromInclusive(), isDispatchBlock(), isEmptyField(), isEmptyRecord(), llvm::DenseMapInfo< DecompositionDeclName >::isEqual(), clang::Sema::IsFloatingPointPromotion(), isForwardingReference(), clang::CodeGen::CodeGenTypes::isFuncParamTypeConvertible(), isFunctionLocalClass(), clang::comments::Sema::isFunctionOrBlockPointerVarLikeDecl(), clang::comments::Sema::isFunctionOrMethodVariadic(), clang::arcmt::trans::MigrationContext::isGCOwnedNonObjC(), clang::CodeGen::ABIInfo::isHomogeneousAggregate(), isImplicitThis(), isInitializerOfDynamicClass(), clang::Sema::isInitListConstructor(), isIntegerLikeType(), clang::Sema::IsIntegralPromotion(), isKnownNonNilCollectionType(), isLiteralType(), IsLLVMStringRef(), clang::Sema::IsMemberPointerConversion(), IsNSError(), isNSStringType(), clang::BinaryOperator::isNullPointerArithmeticExtension(), clang::Expr::isNullPointerConstant(), isObjCIdOrObjectKindOfType(), clang::Sema::isObjCPointerConversion(), isOSObjectRelated(), IsPartOfAST(), isPermittedNeonBaseType(), isPointerToRecordType(), isRecordEmpty(), isRecordWithSSEVectorType(), clang::ento::cocoa::isRefType(), isSafeForCXXConstantCapture(), isSafeToConvert(), IsSameCharType(), isSameEntity(), isScopedEnumerationType(), isSimpleTemplateIdType(), isSingleElementStruct(), IsSmallVector(), isSSEVectorType(), IsStandardConversion(), isStandardLayoutType(), clang::Sema::isStdInitializerList(), IsStdString(), IsStdVector(), isStreamCharSpecialization(), clang::Sema::IsStringLiteralToNonConstPointerConversion(), clang::NSAPI::isSubclassOfNSClass(), isTemplate(), clang::QualType::isTriviallyCopyableType(), clang::QualType::isTrivialType(), IsUserDefinedConversion(), isValidBaseType(), isValidOrderingForOp(), isVarDeclStrongDefinition(), IsVariableSizedType(), isVector(), isVoidPointerToNonConst(), IsVoidStarType(), clang::CodeGen::CodeGenTypes::isZeroInitializable(), loadToBegin(), LookThroughTransitiveAssignmentsAndCommaOperators(), LookupAnyMember(), LookupDirect(), LookupMemberExpr(), LookupMethodInReceiverType(), LookupVisibleDecls(), mangleAArch64VectorBase(), clang::Sema::MarkFunctionReferenced(), MarkUsedTemplateParameters(), clang::analyze_format_string::ArgType::matchesType(), maybeAdjustInterfaceForSubscriptingCheck(), clang::Sema::MaybeBindToTemporary(), clang::ASTContext::mergeFunctionTypes(), clang::ASTContext::mergeObjCGCQualifiers(), clang::ASTContext::mergeTypes(), ObjCEnumerationCollection(), clang::ASTContext::ObjCObjectAdoptsQTypeProtocols(), clang::ASTContext::ObjCQualifiedClassTypesAreCompatible(), clang::ASTContext::ObjCQualifiedIdTypesAreCompatible(), OpenCLConvertScalarsToVectors(), clang::InitializationSequence::Perform(), clang::Sema::PerformContextualImplicitConversion(), clang::Sema::PerformImplicitConversion(), clang::Sema::PerformObjectArgumentInitialization(), PopulateKeysForFields(), printCXXConstructorDestructorName(), printExprAsWritten(), PrintFloatingLiteral(), printIntegral(), clang::APValue::printPretty(), clang::ento::ExprEngine::processSwitch(), PropertyMemoryAttribute(), pushTemporaryCleanup(), clang::ASTContext::QIdProtocolsAdoptObjCObjectProtocols(), clang::TreeTransform< Derived >::RebuildCXXPseudoDestructorExpr(), clang::TreeTransform< Derived >::RebuildUnresolvedUsingType(), recordFixedType(), clang::Sema::RefersToMemberWithReducedAlignment(), clang::Sema::RequireCompleteType(), clang::CodeGen::CodeGenModule::ReturnTypeUsesFP2Ret(), clang::CodeGen::CodeGenModule::ReturnTypeUsesFPRet(), rewriteInputConstraintReferences(), RewriteOneForwardClassDecl(), rewriteToNumericBoxedExpression(), roundUpSizeToCharAlignment(), scanToNextArgument(), clang::Sema::SemaBuiltinShuffleVector(), clang::Sema::SemaConvertVectorExpr(), SemaOpenCLBuiltinEnqueueKernel(), clang::CXXRecordDecl::setBases(), clang::ASTContext::setCFConstantStringType(), setObjCGCLValueClass(), ShouldDiagnoseUnusedDecl(), clang::CodeGen::CodeGenFunction::ShouldNullCheckClassCastValue(), ShouldTryAgainWithRedefinitionType(), clang::Expr::skipRValueSubobjectAdjustments(), skipTopLevelReferences(), clang::Sema::SpecialMemberIsTrivial(), clang::CodeGen::CodeGenFunction::StartFunction(), clang::CodeGen::CodeGenFunction::StartThunk(), clang::ObjCObjectType::stripObjCKindOfTypeAndQuals(), clang::TreeTransform< Derived >::TransformCXXNamedCastExpr(), clang::TreeTransform< Derived >::TransformDependentTemplateSpecializationType(), clang::TreeTransform< Derived >::TransformExceptionSpec(), clang::TreeTransform< Derived >::TransformReferenceType(), clang::TreeTransform< Derived >::TransformTemplateSpecializationType(), clang::TransformTypeSpecType(), TryAddressSpaceCast(), tryAtomicConversion(), TryClassUnification(), TryConstCast(), TryConstructorInitialization(), clang::CodeGen::CodeGenModule::TryEmitBaseDestructorAsAlias(), tryEmitSpecializedAllocInit(), clang::Sema::tryExprAsCall(), tryGCCVectorConvertAndSplat(), tryGetFunctionProtoType(), TryImplicitConversion(), TryListConversion(), TryListInitialization(), TryLValueToRValueCast(), TryObjectArgumentInitialization(), TryReferenceInit(), TryReferenceInitialization(), TryReferenceListInitialization(), TryRefInitWithConversionFunction(), TryReinterpretCast(), TryStaticCast(), TryStaticMemberPointerUpcast(), TryStaticPointerDowncast(), TryStaticReferenceDowncast(), TryUserDefinedConversion(), TryValueInitialization(), TypeIsInnerPointer(), clang::ASTContext::UnwrapSimilarTypes(), UseNSOptionsMacro(), clang::FunctionCallFilterCCC::ValidateCandidate(), clang::ento::ExprEngine::VisitCXXNewAllocatorCall(), clang::ento::ExprEngine::VisitCXXNewExpr(), clang::TextNodeDumper::VisitFunctionDecl(), clang::ento::SValExplainer::VisitSymbolicRegion(), clang::ento::ExprEngine::VisitUnaryExprOrTypeTraitExpr(), and Write_RethrowObject(). This will check for a TypedefType by removing any existing sugar until it reaches a TypedefType or a non-sugared type. Definition at line 404 of file Type.cpp. This will check for a TemplateSpecializationType by removing any existing sugar until it reaches a TemplateSpecializationType or a non-sugared type. Definition at line 408 of file Type.cpp. This will check for an AttributedType by removing any existing sugar until it reaches an AttributedType or a non-sugared type. Definition at line 412 of file Type.cpp. Look through specific kinds of sugar (parens, attributes, etc) for an instance of <specific type>. This is used when you need to walk over sugar nodes that represent some kind of type adjustment from a type that was written as a <specific type> to another type that is still canonically a <specific type>. Definition at line 6785 of file Type.h. A variant of getAs<> for array types which silently discards qualifiers from the outermost type. Definition at line 6817 of file Type.h. Referenced by appendType(), classifyTypeForARCConversion(), clang::CodeGen::CodeGenFunction::EmitCXXNewExpr(), clang::CodeGen::CodeGenFunction::EmitOMPAggregateAssign(), EmitOMPAggregateInit(), EmitOMPAggregateReduction(), clang::ASTContext::getBaseElementType(), getBaseElementTypeUnsafe(), getCanonicalParamType(), clang::ASTContext::getConstantArrayElementCount(), getTypeString(), hasSizedVLAType(), isObjCLifetimeType(), clang::InitListExpr::isStringLiteralInit(), clang::InitializedEntity::isVariableLengthArrayNew(), and SemaBuiltinLaunder(). Definition at line 498 of file Type.cpp. Referenced by handleComplexIntConversion(), and isComplexIntegerType(). Retrieves the CXXRecordDecl that this type refers to, either because the type is a RecordType or because it is the injected-class-name type of a class template or class template partial specialization. Definition at line 1635 of file Type.cpp. Referenced by clang::CodeGen::CGOpenMPRuntimeNVPTX::adjustTargetSpecificDataForLambdas(), assumeNoOverflow(), clang::ento::StoreManager::attemptDownCast(), clang::ASTContext::BlockRequiresCopying(), clang::Sema::BuildCXXConstructExpr(), buildFakeCtorCall(), BuildNonArrayForRange(), calculateOffset(), canRecoverDotPseudoDestructorCallsOnPointerObjects(), clang::Sema::checkAllowedCUDAInitializer(), clang::Sema::CheckBaseSpecifier(), CheckConstexprCtorInitializer(), clang::Sema::CheckCXXThrowOperand(), clang::Sema::CheckDestructor(), clang::CheckEquivalentExceptionSpecImpl(), checkEscapingByref(), checkMoveAssignmentForRepeatedMove(), checkTrivialClassMembers(), checkTrivialSubobjectCall(), checkTupleLikeDecomposition(), CheckUnaryTypeTraitTypeCompleteness(), computeBlockInfo(), clang::Sema::CreateBuiltinBinOp(), clang::ConstructionContext::createFromLayers(), clang::TypeName::createNestedNameSpecifierForScopeOf(), clang::CodeGen::CodeGenFunction::cxxDestructorCanThrow(), decomposeTypeForEH(), clang::Sema::DeduceTemplateSpecializationFromInitializer(), DiagnoseReinterpretUpDownCast(), DiagnoseUninitializedReference(), diagnoseUnreadableFields(), clang::CodeGen::CodeGenFunction::emitAutoVarTypeCleanup(), clang::CodeGen::CodeGenFunction::EmitCallArg(), clang::CodeGen::CodeGenFunction::EmitCXXConstructLValue(), clang::CodeGen::CodeGenFunction::EmitCXXMemberDataPointerAddress(), EmitDeclDestroy(), EmitDestroyingObjectDelete(), clang::CodeGen::CodeGenFunction::EmitLambdaBlockInvokeBody(), emitRTtypeidCall(), clang::ento::StoreManager::evalDerivedToBase(), EvaluateMemberPointer(), evaluateTypeTrait(), EvaluateUnaryTypeTrait(), clang::Sema::FindAllocationFunctions(), findDecomposableBaseClass(), clang::Sema::FindInstantiatedDecl(), forConstantArrayExpansion(), clang::NestedNameSpecifier::getAsRecordDecl(), getBadTypeidFn(), clang::ASTContext::getCommentForDecl(), getConstructedRegion(), getContainedDynamicClass(), clang::CFGImplicitDtor::getDestructorDecl(), clang::CXXInstanceCall::getExtraInvalidatedValues(), clang::Sema::getFixItZeroInitializerForType(), clang::TypeName::getFullyQualifiedNestedNameSpecifier(), clang::ento::ProgramState::getLValue(), clang::CodeGen::CGCXXABI::getMemberPointerAdjustment(), getMSPropertyAttr(), clang::UnresolvedMemberExpr::getNamingClass(), clang::CodeGen::CodeGenFunction::getNaturalTypeAlignment(), getPrettyTypeName(), clang::CXXMemberCallExpr::getRecordDecl(), clang::BlockCall::getRuntimeDefinition(), clang::CXXInstanceCall::getRuntimeDefinition(), getTypeInfoLinkage(), HandleBaseToDerivedCast(), HandleLValueBase(), HandleLValueBasePath(), HandleMemberPointerAccess(), hasAccessibleDestructor(), hasNontrivialDestruction(), clang::ComparisonCategoryInfo::ValueInfo::hasValidIntValue(), InitializationHasSideEffects(), isAutoCastType(), isConsumableType(), clang::CFGCXXRecordTypedCall::isCXXRecordTypedCall(), clang::Sema::IsDerivedFrom(), clang::FunctionDecl::isDestroyingOperatorDelete(), isImplicitThis(), isInAllocaArgument(), isOSObjectRelated(), isPointerToObject(), clang::CXXTypeidExpr::isPotentiallyEvaluated(), isReadByLvalueToRvalueConversion(), isRecordEmpty(), clang::FunctionDecl::isReplaceableGlobalAllocationFunction(), clang::ConstructionContextLayer::isStrictlyMoreSpecificThan(), clang::Sema::isThisOutsideMemberFunctionBody(), clang::CXXRecordDecl::isTriviallyCopyable(), clang::CodeGen::CodeGenModule::isTypeConstant(), isTypeValid(), clang::Expr::isUnusedResultAWarning(), clang::CodeGen::CodeGenFunction::isVptrCheckRequired(), LeastDerivedClassWithSameLayout(), clang::ComparisonCategories::lookupInfo(), lookupStdTypeTraitMember(), mapConsumableAttrState(), clang::CodeGen::CodeGenModule::maybeSetTrivialComdat(), clang::consumed::ConsumedStateMap::operator!=(), PerformReturnAdjustment(), print_elem(), print_initializer(), clang::ento::ExprEngine::ProcessDeleteDtor(), clang::Sema::ProduceConstructorSignatureHelp(), clang::CodeGen::CodeGenFunction::PushDestructorCleanup(), regionMatchesCXXRecordType(), ResolveConstructorOverload(), clang::CXXRecordDecl::setBases(), treatUnusedNewEscaped(), TryListInitialization(), TypeRequiresBuiltinLaunderImp(), usesMultipleInheritanceModel(), visitLocalsRetainedByInitializer(), clang::tooling::RecursiveSymbolVisitor< T >::VisitTypeLoc(), clang::ASTDeclWriter::VisitVarDecl(), clang::ASTDeclReader::VisitVarDeclImpl(), warnAboutAmbiguousFunction(), and warnAboutRedundantParens(). Definition at line 1612 of file Type.cpp. Referenced by CheckObjCBridgeCFCast(), CheckObjCBridgeNSCast(), clang::ASTContext::ObjCQualifiedIdTypesAreCompatible(), and clang::Sema::SelectorsForTypoCorrection(). Definition at line 1604 of file Type.cpp. Definition at line 1594 of file Type.cpp. Definition at line 1584 of file Type.cpp. Definition at line 1570 of file Type.cpp. Definition at line 6540 of file Type.h. Referenced by clang::Sema::BuildBinOp(), clang::Sema::BuildUnaryOp(), clang::Sema::CheckPlaceholderExpr(), checkPlaceholderForOverload(), and clang::Sema::DefaultVariadicArgumentPromotion(). Retrieves the RecordDecl this type refers to. Definition at line 1639 of file Type.cpp. Referenced by EmitNullConstant(), clang::ento::FindUninitializedFields::FindUninitializedFields(), and wasRegionOfInterestModifiedAt(). Definition at line 521 of file Type.cpp. Referenced by appendType(), describeUninitializedArgumentInCall(), clang::CodeGen::emitTaskInit(), isCallback(), and clang::analyze_format_string::ArgType::matchesType(). Retrieves the TagDecl that this type refers to, either because the type is a TagType or because it is the injected-class-name type of a class template or class template partial specialization. Definition at line 1643 of file Type.cpp. Referenced by createConstantGlobalStructAndAddToParent(), createGlobalStruct(), clang::CodeGen::emitDeclareSimdFunction(), emitDestructorsFunction(), emitProxyTaskFunction(), clang::CodeGen::emitTaskInit(), emitTaskPrivateMappingFunction(), clang::CodeGen::CGOpenMPRuntime::emitUpdateLocation(), getAsCXXRecordDecl(), getAsRecordDecl(), getUuidAttrOfType(), and clang::Sema::RequireCompleteDeclContext(). NOTE: getAs*ArrayType are methods on ASTContext. Definition at line 540 of file Type.cpp. Referenced by appendType(), CheckNonNullExpr(), clang::Sema::CheckTransparentUnionArgumentConstraints(), clang::CodeGen::CodeGenFunction::EnterDtorCleanups(), getNonNullAttrs(), IsTransparentUnionStandardConversion(), clang::ASTContext::mergeTransparentUnionType(), and useFirstFieldIfTransparentUnion(). Get the base element type of this type, potentially discarding type qualifiers. Definition at line 6708 of file Type.h. References clang::ast_matchers::arrayType, getAsArrayTypeUnsafe(), and clang::ast_matchers::type. Referenced by clang::Sema::BuildCXXConstructExpr(), buildMemcpyForAssignmentOp(), clang::Sema::checkIllFormedTrivialABIStruct(), CheckUnaryTypeTraitTypeCompleteness(), DiagnoseUninitializedReference(), diagnoseUnreadableFields(), doesUsualArrayDeleteWantSize(), getContainedDynamicClass(), getPointeeOrArrayElementType(), clang::ASTContext::getPreferredTypeAlign(), getUuidAttrOfType(), HasNonDllImportDtor(), hasNontrivialDestruction(), hasSizedVLAType(), InitializationHasSideEffects(), clang::QualType::isCXX11PODType(), isLiteralType(), clang::QualType::isNonTrivialToPrimitiveCopy(), clang::QualType::isNonTrivialToPrimitiveDefaultInitialize(), isReadByLvalueToRvalueConversion(), isSafeForCXXConstantCapture(), isStandardLayoutType(), clang::CodeGen::CodeGenModule::maybeSetTrivialComdat(), print_elem(), and pushTemporaryCleanup(). Definition at line 2367 of file Type.h. Referenced by addAssociatedClassesAndNamespaces(), addConstexprToLambdaDeclSpecifier(), addExceptionSpec(), canHaveNullability(), clang::Sema::CheckFloatComparison(), checkOpenCLPipePacketType(), clang::CodeGen::CodeGenTypes::DeriveThisType(), clang::TypePropertyCache< Private >::ensure(), clang::ASTContext::getASTObjCImplementationLayout(), clang::ASTContext::getCanonicalType(), getCurrentInstantiationOf(), clang::FunctionType::getNameForCallConv(), clang::ASTContext::getObjCGCAttrKind(), clang::LocInfoType::getType(), clang::LinkageComputer::getTypeLinkageAndVisibility(), isLinkageValid(), isLiteralType(), isObjCARCImplicitlyUnretainedType(), isSameQualifier(), parseOpenMPReductionId(), clang::Parser::ParseUnqualifiedId(), clang::ASTNodeImporter::VisitDependentNameType(), and clang::ASTTypeWriter::VisitTagType(). Definition at line 214 of file CanonicalType.h. Referenced by clang::CodeGen::CodeGenTypes::arrangeCXXMethodType(), clang::CodeGen::CodeGenTypes::arrangeFunctionDeclaration(), clang::Sema::checkExceptionSpecification(), evaluateCDTSize(), findDirectBaseWithType(), GetFormalType(), GetReturnType(), and setCUDAKernelCallingConvention(). Get the AutoType whose type will be deduced for a variable with an initializer of this type. This looks through declarators like pointer types, but not through decltype or typedefs. Definition at line 2189 of file Type.h. Referenced by clang::Sema::ActOnObjCForCollectionStmt(), clang::Sema::DeduceTemplateArguments(), clang::Sema::InstantiateFunctionDefinition(), and clang::ASTDeclReader::VisitFunctionDecl(). Get the DeducedType whose type will be deduced for a variable with an initializer of this type. Definition at line 1745 of file Type.cpp. Referenced by clang::Sema::BuildCXXTypeConstructExpr(), clang::Sema::BuildDeclaratorGroup(), clang::ExprWithCleanups::Create(), clang::Sema::DeduceTemplateSpecializationFromInitializer(), clang::Sema::deduceVarTypeFromInitializer(), GetDeclSpecTypeForDeclarator(), clang::isUndeducedReturnType(), LookupDirect(), and clang::TreeTransform< Derived >::RebuildDependentNameType(). Determine the linkage of this type. Definition at line 3668 of file Type.cpp. References clang::TypePropertyCache< Private >::ensure(), and TypeBits. Referenced by clang::CodeGen::CodeGenModule::EmitOMPThreadPrivateDecl(), getExternalLinkageFor(), getTypeInfoLinkage(), getTypeInfoVTable(), clang::LinkageComputer::getTypeLinkageAndVisibility(), getVisibilityOf(), clang::Sema::isExternalWithNoLinkageType(), and clang::ObjCTypeParamType::Profile(). Determine the linkage and visibility of this type. Definition at line 3770 of file Type.cpp. Pull a single level of sugar off of this locally-unqualified type. Users should generally prefer SplitQualType::getSingleStepDesugaredType() or QualType::getSingleStepDesugaredType(const ASTContext&). Definition at line 302 of file Type.cpp. References clang::Qualifiers::addConsistentQualifiers(), clang::Qualifiers::empty(), getAs(), clang::QualType::getSplitDesugaredType(), getTypeClass(), clang::QualType::IgnoreParens(), clang::SplitQualType::Quals, clang::QualType::split(), clang::QualifierCollector::strip(), and clang::SplitQualType::Ty. Referenced by getArrayElementTypeNoTypeQual(), isObjCNSObjectType(), clang::ASTNodeTraverser< Derived, NodeDelegateType >::Visit(), and clang::TextNodeDumper::Visit(). Determine the nullability of the given type. Note that nullability is only captured as sugar within the type system, not as part of the canonical type, so nullability will be lost by canonicalization and desugaring. Definition at line 3775 of file Type.cpp. References getAs(), clang::None, and Type(). Referenced by CheckNonNullExpr(), checkNullabilityTypeSpecifier(), checkObjCKindOfType(), computeConditionalNullability(), clang::Sema::diagnoseNullableToNonnullConversion(), clang::CodeGen::CodeGenFunction::EmitNullabilityCheck(), clang::CodeGen::CodeGenFunction::EmitParmDecl(), clang::ASTContext::getArrayDecayedType(), clang::ASTContext::hasSameNullabilityTypeQualifier(), isNonNullType(), and clang::CodeGen::CodeGenFunction::StartFunction(). Return the implicit lifetime for this type, which must not be dependent. Definition at line 3956 of file Type.cpp. References isObjCARCImplicitlyUnretainedType(), clang::Qualifiers::OCL_ExplicitNone, and clang::Qualifiers::OCL_Strong. Referenced by clang::Sema::CheckParameter(), and clang::Sema::inferObjCARCLifetime(). Retrieve the set of substitutions required when accessing a member of the Objective-C receiver type that is declared in the given context. *this is the type of the object we're operating on, e.g., the receiver for a message send or the base of a property access, and is expected to be of some object or object pointer type. dc The declaration context for which we are building up a substitution mapping, which should be an Objective-C class, extension, category, or method within. an array of type arguments that can be substituted for the type parameters of the given declaration context in any type described within that context, or an empty optional to indicate that no substitution is required. Extract the class from the receiver object type. Definition at line 1389 of file Type.cpp. References castAs(), clang::ObjCObjectType::getInterface(), clang::ASTContext::getObjCObjectType(), clang::DeclContext::getParentASTContext(), clang::ObjCObjectType::getSuperClassType(), clang::ObjCObjectType::getTypeArgs(), clang::QualType::isNull(), clang::ObjCObjectType::isUnspecialized(), clang::None, and clang::ASTContext::ObjCBuiltinIdTy. Referenced by clang::CodeCompletionResult::createCodeCompletionStringForDecl(), and clang::QualType::substObjCMemberType(). If this is a pointer or reference to a RecordType, return the CXXRecordDecl that the type refers to. If this is not a pointer or reference, or the type being pointed to does not refer to a CXXRecordDecl, returns NULL. Definition at line 1620 of file Type.cpp. Referenced by adjustReturnValue(), DiagnoseReinterpretUpDownCast(), clang::ento::retaincountchecker::RetainCountChecker::errorKindToBugKind(), clang::ento::StoreManager::evalDerivedToBase(), getAccessFlag(), isOSObjectPtr(), isSetOnReadPtrType(), regionMatchesCXXRecordType(), and clang::CodeGen::CodeGenFunction::ShouldNullCheckClassCastValue(). If this is a pointer type, return the pointee type. If this is an array type, return the array element type. This should never be used when type qualifiers are meaningful. Definition at line 6715 of file Type.h. References getBaseElementTypeUnsafe(), getPointeeType(), clang::QualType::getTypePtr(), isAnyPointerType(), isArrayType(), and clang::ast_matchers::type. Referenced by getArrayIndexingBound(), IsTailPaddedMemberArray(), and SemaOpenCLBuiltinEnqueueKernel(). If this is a pointer, ObjC object pointer, or block pointer, this returns the respective pointee. Definition at line 505 of file Type.cpp. Referenced by clang::Sema::ActOnCXXDelete(), clang::Sema::ActOnStartCXXMemberReference(), clang::CodeGen::CGDebugInfo::addHeapAllocSiteMetadata(), adjustCVQualifiersForCXXThisWithinLambda(), assumeNoOverflow(), clang::ASTContext::AtomicUsesUnsupportedLibcall(), clang::ento::StoreManager::attemptDownCast(), clang::Sema::BuildDeclarationNameExpr(), clang::Sema::BuildPseudoDestructorExpr(), clang::Sema::BuildQualifiedType(), calculateOffset(), clang::arcmt::trans::canApplyWeak(), clang::canCalleeThrow(), captureThis(), clang::ento::StoreManager::castRegion(), castToBase(), checkArithmeticBinOpPointerOperands(), checkArithmeticIncompletePointerType(), checkArithmeticOpPointerOperand(), CheckArrow(), clang::Sema::CheckCompatibleReinterpretCast(), checkConditionalPointerCompatibility(), clang::Sema::CheckCXXThrowOperand(), clang::Sema::CheckDistantExceptionSpec(), CheckFallThroughForBody(), CheckIndirectionOperand(), CheckKeyForObjCARCConversion(), checkMapClauseExpressionBase(), CheckMemaccessSize(), clang::ento::mpi::MPIChecker::checkMissingWaits(), CheckNonNullArguments(), checkNullabilityTypeSpecifier(), CheckObjCBridgeCFCast(), CheckObjCBridgeNSCast(), clang::Sema::CheckObjCConversion(), clang::Sema::CheckSpecifiedExceptionType(), clang::Sema::CheckUnaryExprOrTypeTraitOperand(), clang::Sema::CheckVirtualDtorCall(), ClassifyDiagnostic(), classifyPointerDeclarator(), classifyTypeForARCConversion(), clang::Sema::CodeCompleteMemberReferenceExpr(), CompareStandardConversionSequences(), computeCachedProperties(), clang::LinkageComputer::computeTypeLinkageInfo(), clang::CodeGen::CodeGenModule::ConstructAttributeList(), createBinOpInfoFromIncDec(), decomposeTypeForEH(), DeduceTemplateArgumentsByTypeMatch(), clang::Sema::DefineImplicitCopyAssignment(), dereference(), DereferenceInfo::DereferenceInfo(), describeUninitializedArgumentInCall(), diagnoseArithmeticOnFunctionPointer(), diagnoseArithmeticOnTwoFunctionPointers(), DiagnoseCastOfObjCSEL(), DiagnoseDivisionSizeofPointer(), clang::Sema::DiagnoseSentinelCalls(), diagnoseStringPlusChar(), clang::Sema::DiscardMisalignedMemberAddress(), doRewriteToUTF8StringBoxedExpressionHelper(), clang::CodeGen::CodeGenFunction::EmitAlignmentAssumptionCheck(), EmitAtomicCmpXchgForMSIntrin(), clang::CodeGen::CodeGenFunction::EmitAtomicExpr(), EmitBinaryAtomicPost(), clang::CodeGen::CodeGenFunction::EmitCallee(), EmitCheckedMixedSignMultiply(), clang::CodeGen::CodeGenFunction::EmitCXXConstructorCall(), EmitISOVolatileLoad(), EmitISOVolatileStore(), clang::CodeGen::CodeGenFunction::EmitLoadOfReference(), clang::CodeGen::CodeGenFunction::EmitLoadOfReferenceLValue(), clang::CodeGen::CodeGenFunction::EmitLValueForField(), clang::CodeGen::CodeGenFunction::EmitMemberExpr(), clang::CodeGen::CodeGenFunction::EmitObjCIvarRefLValue(), clang::CodeGen::CodeGenFunction::EmitOMPArraySectionExpr(), clang::CodeGen::CodeGenFunction::EmitUnaryOpLValue(), evalBinOpFieldRegionFieldRegion(), EvaluateComparisonBinaryOperator(), clang::Sema::ExtractUnqualifiedFunctionType(), clang::analyze_printf::PrintfSpecifier::fixType(), clang::analyze_scanf::ScanfSpecifier::fixType(), GeneralizeType(), clang::CodeGen::CodeGenFunction::GenerateObjCAtomicGetterCopyHelperFunction(), clang::CodeGen::CodeGenFunction::GenerateObjCAtomicSetterCopyHelperFunction(), getAArch64LS(), GetAlignOfExpr(), GetAlignOfType(), clang::OMPArraySectionExpr::getBaseOriginalType(), GetBaseType(), clang::QualType::getBaseTypeIdentifier(), clang::Expr::getBestDynamicClassType(), clang::CallExpr::getCallReturnType(), getCanonicalParamType(), getCastAwayConstnessCastKind(), getCoreType(), getCXXRecord(), clang::ASTContext::getDeclAlign(), clang::getDeclUsageType(), getDeepPointeeType(), clang::MemberExpr::getEndLoc(), clang::CXXInstanceCall::getExtraInvalidatedValues(), clang::TypeName::getFullyQualifiedType(), clang::ASTContext::getInnerObjCOwnership(), clang::PointerLikeTypeLoc< ObjCObjectPointerTypeLoc, ObjCObjectPointerType >::getInnerType(), clang::DependentAddressSpaceTypeLoc::getInnerType(), clang::UnresolvedMemberExpr::getNamingClass(), clang::CodeGen::CodeGenFunction::getNaturalPointeeTypeAlignment(), clang::QualType::getNonLValueExprType(), clang::QualType::getNonReferenceType(), clang::OverloadCandidate::getNumParams(), getObjCBridgeAttr(), clang::ASTContext::getObjCGCQualType(), clang::getParameterABISpelling(), getPointeeCXXRecordDecl(), getPointeeOrArrayElementType(), getPointeeType(), getPrettyTypeName(), clang::CXXMemberCallExpr::getRecordDecl(), clang::CXXInstanceCall::getRuntimeDefinition(), clang::ASTContext::getTargetNullPointerValue(), clang::GetUnderlyingFunction(), getUuidAttrOfType(), handleAssignment(), HandleBaseToDerivedCast(), handleCompoundAssignment(), HandleConstructorCall(), HandleMemberPointerAccess(), handleObjCOwnershipTypeAttr(), clang::Sema::handlerCanCatch(), InitCatchParam(), clang::CXXDynamicCastExpr::isAlwaysNull(), clang::Sema::IsBlockPointerConversion(), isCallback(), clang::CXXMethodDecl::isCopyAssignmentOperator(), clang::comments::Sema::isFunctionOrMethodVariadic(), clang::arcmt::trans::MigrationContext::isGCOwnedNonObjC(), clang::Sema::isInitListConstructor(), clang::CXXMethodDecl::isMoveAssignmentOperator(), clang::Expr::isNullPointerConstant(), isOSObjectRelated(), isPointerToConst(), isPointerToObject(), isRecordEmpty(), clang::FunctionDecl::isReplaceableGlobalAllocationFunction(), clang::Sema::IsStringLiteralToNonConstPointerConversion(), IsTypeModifiable(), isValidOrderingForOp(), isVoidPointer(), isVoidPointerToNonConst(), loadToBegin(), LookupMemberExpr(), MakeBinaryAtomicValue(), clang::analyze_format_string::ArgType::matchesType(), clang::Sema::MaybeBindToTemporary(), clang::Sema::PerformImplicitConversion(), clang::Sema::PerformObjectArgumentInitialization(), clang::Sema::PerformQualificationConversion(), PerformReturnAdjustment(), clang::ento::printDynamicTypeInfo(), clang::APValue::printPretty(), clang::Sema::RefersToMemberWithReducedAlignment(), RewriteOneForwardClassDecl(), roundUpSizeToCharAlignment(), scanToNextArgument(), SemaBuiltinLaunder(), SemaOpenCLBuiltinEnqueueKernel(), clang::CodeGen::CodeGenFunction::ShouldNullCheckClassCastValue(), clang::CodeGen::CodeGenFunction::StartFunction(), clang::TransformTypeSpecType(), treatUnusedNewEscaped(), tryEmitFMulAdd(), tryEvaluateBuiltinObjectSize(), clang::Sema::tryExprAsCall(), tryGetFunctionProtoType(), TryObjectArgumentInitialization(), TryReinterpretCast(), TryStaticCast(), clang::ASTContext::UnwrapSimilarTypes(), clang::FunctionCallFilterCCC::ValidateCandidate(), clang::consumed::ConsumedStmtVisitor::VisitCXXConstructExpr(), clang::consumed::ConsumedStmtVisitor::VisitParmVarDecl(), and wasRegionOfInterestModifiedAt(). Given that this is a scalar type, classify it. Definition at line 1989 of file Type.cpp. References clang::QualType::getTypePtr(), isScalarType(), STK_BlockPointer, STK_Bool, STK_CPointer, STK_FixedPoint, STK_Floating, STK_FloatingComplex, STK_Integral, STK_IntegralComplex, STK_MemberPointer, and STK_ObjCObjectPointer. Referenced by matchTypes(), and clang::Sema::ScalarTypeToBooleanCastKind(). Definition at line 1820 of file Type.h. Referenced by addAssociatedClassesAndNamespaces(), clang::TypoCorrectionConsumer::addNamespaces(), canHaveNullability(), CanUseSingleInheritance(), clang::LocInfoType::classof(), clang::BuiltinType::classof(), clang::ComplexType::classof(), clang::ParenType::classof(), clang::PointerType::classof(), clang::AdjustedType::classof(), clang::DecayedType::classof(), clang::BlockPointerType::classof(), clang::ReferenceType::classof(), clang::LValueReferenceType::classof(), clang::RValueReferenceType::classof(), clang::MemberPointerType::classof(), clang::ArrayType::classof(), clang::ConstantArrayType::classof(), clang::IncompleteArrayType::classof(), clang::VariableArrayType::classof(), clang::DependentSizedArrayType::classof(), clang::DependentAddressSpaceType::classof(), clang::DependentSizedExtVectorType::classof(), clang::VectorType::classof(), clang::DependentVectorType::classof(), clang::ExtVectorType::classof(), clang::FunctionType::classof(), clang::FunctionNoProtoType::classof(), clang::FunctionProtoType::classof(), clang::UnresolvedUsingType::classof(), clang::TypedefType::classof(), clang::TypeOfExprType::classof(), clang::TypeOfType::classof(), clang::DecltypeType::classof(), clang::UnaryTransformType::classof(), clang::TagType::classof(), clang::RecordType::classof(), clang::EnumType::classof(), clang::AttributedType::classof(), clang::TemplateTypeParmType::classof(), clang::SubstTemplateTypeParmType::classof(), clang::SubstTemplateTypeParmPackType::classof(), clang::DeducedType::classof(), clang::AutoType::classof(), clang::DeducedTemplateSpecializationType::classof(), clang::TemplateSpecializationType::classof(), clang::InjectedClassNameType::classof(), clang::ElaboratedType::classof(), clang::DependentNameType::classof(), clang::DependentTemplateSpecializationType::classof(), clang::PackExpansionType::classof(), clang::ObjCTypeParamType::classof(), clang::ObjCObjectType::classof(), clang::ObjCInterfaceType::classof(), clang::ObjCObjectPointerType::classof(), clang::AtomicType::classof(), clang::PipeType::classof(), clang::CodeGen::CGDebugInfo::completeUnusedClass(), computeCachedProperties(), clang::LinkageComputer::computeTypeLinkageInfo(), clang::CodeGen::CodeGenTypes::ConvertType(), clang::Sema::CreateParsedType(), getAsSugar(), clang::QualType::getBaseTypeIdentifier(), clang::CodeGen::CodeGenFunction::getEvaluationKind(), clang::ast_type_traits::ASTNodeKind::getFromNode(), getLocallyUnqualifiedSingleStepDesugaredType(), clang::ASTContext::getTypeInfo(), getTypeInfoLinkage(), clang::TypeLoc::getTypeLocClass(), clang::UnqualTypeLoc::getTypeLocClass(), getUnqualifiedDesugaredType(), clang::ASTContext::getVariableArrayDecayedType(), clang::QualType::isCXX98PODType(), isLayoutCompatible(), isObjCReceiverType(), IsPossiblyOpaquelyQualifiedType(), isSpecifierType(), isTypeSubstitutable(), MarkUsedTemplateParameters(), clang::Sema::MaybeBindToTemporary(), clang::ASTContext::mergeTypes(), splitAccordingToPolicy(), clang::RecursiveASTVisitor< CallGraph >::TraverseType(), typeIsPostfix(), UnwrapTypeForDebugInfo(), clang::TypeVisitor< ASTNodeImporter, ExpectedType >::Visit(), and clang::ASTTypeWriter::Visit(). Definition at line 2724 of file Type.cpp. Referenced by clang::TextNodeDumper::Visit(), and clang::ASTNodeImporter::VisitType(). Return the specified type with any "sugar" removed from the type, removing any typedefs, typeofs, etc., as well as any qualifiers. getUnqualifiedDesugaredType - Pull any qualifiers and syntactic sugar off the given type. This should produce an object of the same dynamic type as the canonical type. Definition at line 419 of file Type.cpp. Referenced by assumeNoOverflow(), getArrayElementTypeNoTypeQual(), getAsStructureType(), getAsUnionType(), clang::ASTContext::getTargetNullPointerValue(), clang::ASTContext::getTypeInfo(), and clang::ASTContext::getUnqualifiedArrayType(). Determine the visibility of this type. Definition at line 2313 of file Type.h. Referenced by extractPBaseFlags(), and getTypeInfoLinkage(). Determine whether this type had the specified attribute applied to it (looking through top-level type sugar). Definition at line 1652 of file Type.cpp. 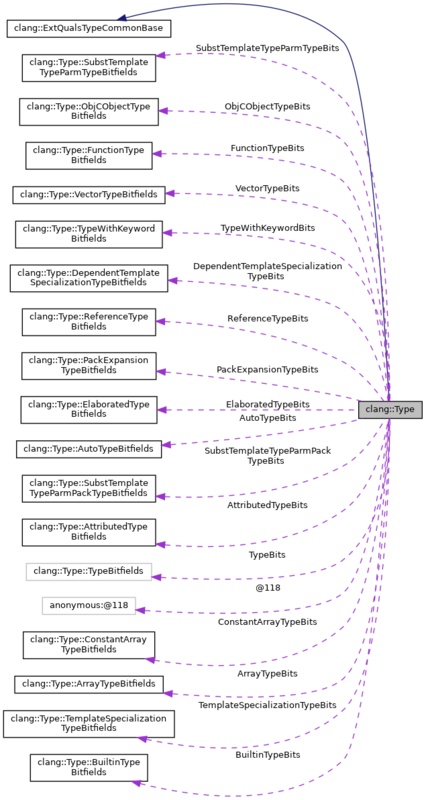 References getAs(), clang::ArrayType::getElementType(), clang::DependentSizedExtVectorType::getElementType(), clang::VectorType::getElementType(), clang::ParenType::getInnerType(), clang::AttributedType::getModifiedType(), clang::ElaboratedType::getNamedType(), clang::AdjustedType::getOriginalType(), clang::PointerType::getPointeeType(), clang::BlockPointerType::getPointeeType(), clang::MemberPointerType::getPointeeType(), clang::ReferenceType::getPointeeTypeAsWritten(), clang::FunctionType::getReturnType(), clang::QualType::getTypePtr(), clang::FunctionProtoType::hasTrailingReturn(), and clang::QualType::isNull(). Determine whether this type was written with a leading 'auto' corresponding to a trailing return type (possibly for a nested function type within a pointer to function type or similar). Definition at line 1750 of file Type.cpp. Determine whether this type has a floating-point representation of some sort, e.g., it is a floating-point type or a vector thereof. Definition at line 1952 of file Type.cpp. Referenced by checkArithmeticOrEnumeralCompare(), checkArithmeticOrEnumeralThreeWayCompare(), clang::Sema::CheckVectorLogicalOperands(), diagnoseTautologicalComparison(), and EmitCompare(). Determine whether this type has an integer representation of some sort, e.g., it is an integer type or a vector. Definition at line 1755 of file Type.cpp. Referenced by clang::Sema::ActOnOpenMPDeclareSimdDirective(), clang::Sema::CheckShiftOperands(), createBinOpInfoFromIncDec(), and clang::Sema::SemaBuiltinShuffleVector(). Whether this type can represent an objective pointer type for the purpose of GC'ability. Definition at line 6704 of file Type.h. Whether this type is represented natively as a pointer. This includes pointers, references, block pointers, and Objective-C interface, qualified id, and qualified interface types, as well as nullptr_t. Definition at line 6699 of file Type.h. Referenced by Evaluate(), EvaluatePointer(), ignorePointerCastsAndParens(), is32Or64BitBasicType(), rewriteInputConstraintReferences(), and shouldEmitSeparateBlockRetain(). Determine whether this type has an signed integer representation of some sort, e.g., it is an signed integer type or a vector. Definition at line 1896 of file Type.cpp. Referenced by AnalyzeComparison(), canConvertIntToOtherIntTy(), canConvertIntTyToFloatTy(), castValueToType(), EmitCompare(), emitEmptyOrdered(), clang::ASTContext::getCorrespondingUnsignedType(), clang::CodeGen::ABIArgInfo::getExtend(), GetIntrinsic(), handleIntegerConversion(), and clang::analyze_format_string::ArgType::matchesType(). Whether this type involves a variable-length array type with a definite size. Definition at line 4043 of file Type.cpp. References getAs(), getAsArrayTypeUnsafe(), getBaseElementTypeUnsafe(), clang::QualType::getObjCLifetime(), clang::RecordDecl::isNonTrivialToPrimitiveDestroy(), isVariablyModifiedType(), clang::Qualifiers::OCL_Autoreleasing, clang::Qualifiers::OCL_ExplicitNone, clang::Qualifiers::OCL_None, clang::Qualifiers::OCL_Strong, and clang::Qualifiers::OCL_Weak. Whether this type is or contains a local or unnamed type. Definition at line 3673 of file Type.cpp. Determine whether this type has an unsigned integer representation of some sort, e.g., it is an unsigned integer type or a vector. Definition at line 1936 of file Type.cpp. Referenced by AnalyzeComparison(), checkOpenMPLoop(), DiagnoseBadShiftValues(), and DiagnoseFloatingImpCast(). Determines whether the type is a C++ aggregate type or C aggregate or union type. An aggregate type is an array or a class type (struct, union, or class) that has no user-declared constructors, no private or protected non-static data members, no base classes, and no virtual functions (C++ [dcl.init.aggr]p1). The notion of an aggregate type subsumes the notion of C aggregates (C99 6.2.5p21) because it also includes union types. Definition at line 2029 of file Type.cpp. Referenced by EmitX86_64VAArgFromMemory(), EvaluateUnaryTypeTrait(), TryListConversion(), and TryListInitialization(). Definition at line 2515 of file Type.cpp. Referenced by getUsualDeleteParams(), and clang::FunctionDecl::isReplaceableGlobalAllocationFunction(). Determine whether this type is any of the built-in character types. Definition at line 1845 of file Type.cpp. Referenced by clang::Sema::BuildExpressionFromIntegralTemplateArgument(), diagnoseStringPlusChar(), clang::analyze_printf::PrintfSpecifier::fixType(), clang::analyze_scanf::ScanfSpecifier::fixType(), and clang::UserDefinedLiteral::getLiteralOperatorKind(). Definition at line 6389 of file Type.h. Referenced by addBaseAndFieldSizes(), checkArithmeticOrEnumeralCompare(), createBinOpInfoFromIncDec(), clang::CodeGen::CodeGenFunction::EmitAggregateCopy(), clang::CodeGen::CodeGenFunction::EmitComplexToScalarConversion(), clang::CodeGen::CodeGenFunction::EmitLValue(), emitReplacement(), clang::CodeGen::CodeGenFunction::EmitUnaryOpLValue(), EmitX86_64VAArgFromMemory(), Evaluate(), EvaluateBuiltinConstantP(), EvaluateComparisonBinaryOperator(), EvaluateComplex(), clang::CodeGen::CodeGenFunction::EvaluateExprAsBool(), EvaluateUnaryTypeTrait(), FindDesignatorMismatch(), getAbsoluteValueKind(), GetIntrinsic(), clang::CodeGen::ABIInfo::isHomogeneousAggregate(), isLiteralType(), IsStandardConversion(), clang::ento::SValBuilder::makeZeroVal(), requiresAMDGPUProtectedVisibility(), rewriteInputConstraintReferences(), TryListInitialization(), clang::ento::ExprEngine::VisitInitListExpr(), and clang::ento::ExprEngine::VisitUnaryOperator(). Definition at line 6312 of file Type.h. Referenced by clang::Sema::ActOnOpenMPCopyprivateClause(), clang::Sema::ActOnOpenMPPrivateClause(), AreTypesCompatible(), AuditedType(), clang::Sema::BuildQualifiedType(), CastsAwayConstness(), clang::Sema::CheckAdditionOperands(), checkArithmeticBinOpPointerOperands(), checkArithmeticIncompletePointerType(), checkArithmeticOpPointerOperand(), checkBuiltinArgument(), checkConditionalNullPointer(), checkMapClauseExpressionBase(), checkMapConflicts(), checkNullabilityTypeSpecifier(), clang::Sema::CheckPointerConversion(), computeConditionalNullability(), diagnoseArithmeticOnFunctionPointer(), diagnoseArithmeticOnTwoFunctionPointers(), DiagnoseBadFunctionCast(), DiagnoseCastQual(), DiagnoseNullConversion(), diagnosePointerIncompatibility(), diagnoseStringPlusChar(), clang::ento::SMTConv::doTypeConversion(), emitOutlinedFunctionPrologue(), evalBinOpFieldRegionFieldRegion(), clang::Sema::FindCompositePointerType(), clang::ento::SMTConv::fromCast(), clang::ento::SMTConv::getBinExpr(), getNonNullAttr(), clang::ASTContext::getObjCGCAttrKind(), clang::ASTContext::getObjCGCQualType(), getPointeeOrArrayElementType(), getReceiverNullability(), clang::CXXMemberCallExpr::getRecordDecl(), clang::ento::SMTConv::getZeroExpr(), isCallback(), clang::ento::isDereferencableType(), clang::ento::Loc::isLocType(), isPointerToConst(), clang::CodeGen::CodeGenTypes::isPointerZeroInitializable(), isRecordEmpty(), clang::ASTContext::isSentinelNullExpr(), IsStandardConversion(), TryReinterpretCast(), TypeIsInnerPointer(), and clang::FunctionCallFilterCCC::ValidateCandidate(). Definition at line 1974 of file Type.cpp. Referenced by clang::Sema::CheckAdditionOperands(), checkArithmeticOrEnumeralCompare(), checkArithmeticOrEnumeralThreeWayCompare(), clang::Sema::CheckCompareOperands(), clang::Sema::CheckConditionalOperands(), clang::Sema::CheckMultiplyDivideOperands(), clang::Sema::CheckSubtractionOperands(), clang::Sema::CXXCheckConditionalOperands(), DiagnoseBadFunctionCast(), clang::Sema::DiagnosePropertyAccessorMismatch(), clang::ento::SMTConv::doTypeConversion(), clang::CodeGen::CodeGenFunction::EmitUnaryOpLValue(), EvaluateUnaryTypeTrait(), clang::ento::MemRegionManager::getVarRegion(), IsStandardConversion(), IsVectorConversion(), and tryGCCVectorConvertAndSplat(). Definition at line 6357 of file Type.h. Referenced by clang::Sema::ActOnCXXDelete(), clang::Sema::ActOnOpenMPAlignedClause(), clang::Sema::ActOnOpenMPDeclareSimdDirective(), clang::Sema::ActOnOpenMPIsDevicePtrClause(), clang::CodeGen::swiftcall::SwiftAggLowering::addTypedData(), AdjustFunctionParmAndArgTypesForDeduction(), clang::Sema::BuildAtomicType(), clang::Sema::BuildCompoundLiteralExpr(), clang::Sema::BuildCXXTypeConstructExpr(), clang::Sema::BuildExceptionDeclaration(), clang::Sema::BuildExpressionFromDeclTemplateArgument(), buildSingleCopyAssign(), clang::Sema::CheckConditionVariable(), clang::Sema::CheckConversionDeclarator(), clang::Sema::CheckFunctionReturnType(), checkMapClauseExpressionBase(), clang::Sema::CheckNonTypeTemplateParameterType(), checkNullabilityTypeSpecifier(), clang::Sema::CheckParameter(), clang::Sema::CheckSpecifiedExceptionType(), ClassifyTemporary(), clang::CXXBindTemporaryExpr::Create(), DereferenceInfo::DereferenceInfo(), clang::Sema::DiagnoseAssignmentResult(), diagnoseTautologicalComparison(), doRewriteToUTF8StringBoxedExpressionHelper(), clang::CodeGen::CodeGenFunction::EmitAggregateCopy(), clang::CodeGen::CodeGenFunction::emitArrayDestroy(), clang::CodeGen::CodeGenFunction::EmitArrayToPointerDecay(), clang::CodeGen::CodeGenFunction::EmitAutoVarAlloca(), clang::CodeGen::CodeGenFunction::emitAutoVarTypeCleanup(), emitOMPArraySectionBase(), clang::CodeGen::CodeGenFunction::EmitOMPCopy(), clang::CodeGen::CodeGenFunction::EmitOMPFirstprivateClause(), emitPrivatesInit(), clang::CodeGen::emitSingleReductionCombiner(), Evaluate(), EvaluateArray(), EvaluateArrayTypeTrait(), EvaluateBinaryTypeTrait(), EvaluateInPlace(), EvaluateUnaryTypeTrait(), FastEvaluateAsRValue(), FindDesignatorMismatch(), findSubobject(), clang::ASTContext::getAdjustedParameterType(), clang::QualType::getBaseTypeIdentifier(), getBlockLayoutInfoString(), clang::ASTContext::GetBuiltinType(), getCoreType(), clang::ASTContext::getDecayedType(), clang::ASTContext::getExceptionObjectType(), GetGCAttrTypeForType(), clang::ASTContext::getInnerObjCOwnership(), clang::ASTContext::getObjCEncodingTypeSize(), getPointeeOrArrayElementType(), getUuidAttrOfType(), clang::ASTContext::hasUniqueObjectRepresentations(), identifyCall(), clang::InitializationSequence::InitializeFrom(), clang::ento::NonLoc::isCompoundType(), clang::Expr::isConstantInitializer(), isDesignatorAtObjectEnd(), clang::arcmt::trans::MigrationContext::isGCOwnedNonObjC(), isRecordEmpty(), isSimpleZero(), IsStandardConversion(), isValidBaseType(), isZeroSized(), clang::ento::SValBuilder::makeZeroVal(), clang::ento::ExprEngine::ProcessInitializer(), processTypeAttrs(), pushTemporaryCleanup(), scanToNextArgument(), setObjCGCLValueClass(), TryListConversion(), TryReferenceInit(), TryReferenceInitializationCore(), clang::ento::ExprEngine::VisitInitListExpr(), visitLocalsRetainedByInitializer(), and clang::ento::ExprEngine::VisitMemberExpr(). Definition at line 6418 of file Type.h. Referenced by AnalyzeAssignment(), AnalyzeCompoundAssignment(), AnalyzeImplicitConversions(), clang::Sema::BuildAtomicType(), clang::Sema::BuildQualifiedType(), CheckBoolLikeConversion(), CheckImplicitConversion(), clang::Sema::CheckSingleAssignmentConstraints(), clang::Sema::CreateBuiltinBinOp(), clang::Sema::CreateBuiltinUnaryOp(), diagnoseRedundantReturnTypeQualifiers(), clang::CodeGen::CodeGenFunction::EmitAtomicInit(), clang::CodeGen::CodeGenFunction::EmitAtomicLoad(), clang::CodeGen::CodeGenFunction::EmitAtomicStore(), clang::CodeGen::CodeGenFunction::EmitExprAsInit(), clang::CodeGen::CodeGenFunction::EmitLoadOfScalar(), clang::CodeGen::CodeGenFunction::EmitStoreOfScalar(), Evaluate(), EvaluateAtomic(), EvaluateInPlace(), findPeephole(), isBlockVarRef(), isValidOrderingForOp(), and clang::InitializationSequence::Perform(). Definition at line 3923 of file Type.cpp. Definition at line 6316 of file Type.h. Referenced by AuditedType(), clang::ASTContext::BlockRequiresCopying(), clang::Sema::BuildObjCBridgedCast(), CanThrow(), clang::ento::StoreManager::castRegion(), CastsAwayConstness(), checkBlockType(), checkBuiltinArgument(), clang::Sema::CheckCompleteVariableDeclaration(), checkConditionalBlockPointerCompatibility(), checkConditionalNullPointer(), clang::Sema::CheckConditionalOperands(), CheckObjCCollectionLiteralElement(), clang::Sema::CheckSubscriptingKind(), compareConversionFunctions(), computeCopyInfoForBlockCapture(), clang::Sema::CreateBuiltinBinOp(), clang::Sema::CreateBuiltinUnaryOp(), clang::CodeCompletionResult::createCodeCompletionStringForDecl(), DiagnoseBadFunctionCast(), DiagnoseNullConversion(), diagnoseObjCARCConversion(), diagnoseTautologicalComparison(), DiagnoseUninitializedUse(), clang::ento::SMTConv::doTypeConversion(), clang::CodeGen::CodeGenFunction::EmitARCRetain(), clang::CodeGen::CodeGenFunction::EmitARCRetainAutorelease(), clang::CodeGen::CodeGenFunction::EmitARCStoreStrong(), clang::CodeGen::CodeGenFunction::EmitCallExpr(), clang::ento::SValBuilder::evalCast(), FormatFunctionParameter(), clang::ento::SMTConv::fromCast(), getBlockFieldFlagsForObjCObjectPointer(), clang::ASTContext::getByrefLifetime(), clang::Decl::getFunctionType(), GetGCAttrTypeForType(), getNonNullAttr(), clang::ASTContext::getObjCGCAttrKind(), clang::CallEventManager::getSimpleCall(), clang::Sema::getVariadicCallType(), clang::ento::SMTConv::getZeroExpr(), handleObjCGCTypeAttr(), is32Or64BitBasicType(), isBlockPointer(), isCallback(), clang::comments::Sema::isFunctionOrBlockPointerVarLikeDecl(), clang::comments::Sema::isFunctionOrMethodVariadic(), clang::ento::Loc::isLocType(), isObjCARCBridgableType(), isObjCRetainableType(), clang::CodeGen::CodeGenTypes::isPointerZeroInitializable(), clang::ento::isPrimitiveType(), IsStandardConversion(), clang::analyze_format_string::ArgType::matchesType(), clang::ASTContext::mergeTypes(), clang::Sema::PrepareCastToObjCObjectPointer(), PropertyMemoryAttribute(), rewriteInputConstraintReferences(), RewriteOneForwardClassDecl(), rewriteToObjCProperty(), shouldEmitSeparateBlockRetain(), SuggestInitializationFixit(), TryReinterpretCast(), TryStaticCast(), and TypeIsInnerPointer(). Definition at line 6677 of file Type.h. Referenced by AnalyzeBitFieldAssignment(), clang::ento::SMTConstraintManager::assumeSym(), clang::Sema::BuildExtVectorType(), clang::Sema::BuildVectorType(), checkArithmeticOrEnumeralThreeWayCompare(), CheckConvertedConstantConversions(), CheckImplicitConversion(), checkIntToPointerCast(), clang::Sema::CheckLoopHintExpr(), CheckTautologicalComparison(), create_OSAtomicCompareAndSwap(), createBinOpInfoFromIncDec(), DiagnoseBadFunctionCast(), EmitIntegerTruncationCheckHelper(), clang::ento::SValBuilder::evalCast(), ExprLooksBoolean(), clang::ento::SMTConv::fromCast(), getIntegerWidthAndSignedness(), clang::ASTContext::getIntWidth(), clang::ento::SMTConstraintManager::getSymVal(), clang::ento::SMTConv::getZeroExpr(), handleCompoundAssignment(), HandleIntToIntCast(), hasBooleanRepresentation(), isBooleanType(), clang::Sema::IsIntegralPromotion(), clang::Expr::isKnownToHaveBooleanValue(), IsStandardConversion(), mangleAArch64VectorBase(), clang::ento::SMTConv::mkSort(), clang::Sema::PerformImplicitConversion(), clang::Sema::prepareVectorSplat(), printIntegral(), clang::APValue::printPretty(), rewriteToNumericBoxedExpression(), clang::CodeGen::CodeGenFunction::ShouldNullCheckClassCastValue(), TryReinterpretCast(), and TryStaticCast(). Helper methods to distinguish type categories. All type predicates operate on the canonical type, ignoring typedefs and qualifiers. Returns true if the type is a builtin type. Definition at line 6377 of file Type.h. Referenced by clang::Sema::BuildVectorType(), EmitX86_64VAArgFromMemory(), clang::ASTContext::getExtVectorType(), clang::ASTContext::getVectorType(), clang::ento::isPrimitiveType(), isRecordWithSSEVectorType(), isTypeSubstitutable(), and mangleAArch64VectorBase(). Determines if this type would be canonical if it had no further qualification. Definition at line 1846 of file Type.h. Referenced by addExceptionSpec(), areCompatVectorTypes(), clang::Sema::CheckFloatComparison(), clang::TypePropertyCache< Private >::ensure(), clang::ASTContext::getASTObjCImplementationLayout(), clang::ASTContext::getFloatingTypeSemanticOrder(), clang::TemplateTypeParmType::getIdentifier(), clang::ASTContext::getMemberPointerType(), clang::FunctionType::getNameForCallConv(), clang::ASTContext::getSubstTemplateTypeParmPackType(), clang::LinkageComputer::getTypeLinkageAndVisibility(), clang::FunctionProtoType::Profile(), and clang::ASTTypeWriter::VisitTagType(). Determine whether the given type T is a "bridgeable" C type. Definition at line 4034 of file Type.cpp. References isRecordType(), isVoidType(), and Pointer. Definition at line 1831 of file Type.cpp. Definition at line 1837 of file Type.cpp. Definition at line 1825 of file Type.cpp. Definition at line 1809 of file Type.cpp. Referenced by clang::Sema::CheckLoopHintExpr(), clang::analyze_printf::PrintfSpecifier::fixType(), isArithmeticArgumentPromotion(), clang::BinaryOperator::isNullPointerArithmeticExtension(), isSameWidthConstantConversion(), and printIntegral(). Definition at line 437 of file Type.cpp. Definition at line 6474 of file Type.h. Definition at line 487 of file Type.cpp. Referenced by clang::ento::SMTConstraintManager::canReasonAbout(), DiagnoseBadFunctionCast(), EvaluateComparisonBinaryOperator(), and clang::CodeGen::CGDebugInfo::remapDIPath(). isComplexType() does not include complex integers (a GCC extension). isComplexIntegerType() can be used to test for complex integers. Definition at line 481 of file Type.cpp. Referenced by clang::ento::SMTConstraintManager::canReasonAbout(), DiagnoseBadFunctionCast(), EvaluateComplex(), clang::ASTContext::getFloatingTypeOfSizeWithinDomain(), and clang::ento::NonLoc::isCompoundType(). Tests whether the type is categorized as a compound type. True for types specified in C++0x [basic.compound]. Definition at line 6282 of file Type.h. Definition at line 6361 of file Type.h. Return true if this is not a variable sized type, according to the rules of C99 6.7.5p3. isConstantSizeType - Return true if this is not a variable sized type, according to the rules of C99 6.7.5p3. It is not legal to call this on incomplete types. It is not legal to call this on incomplete types or dependent types. Definition at line 2043 of file Type.cpp. Referenced by clang::CodeGen::CodeGenModule::ConstructAttributeList(), clang::CodeGen::CodeGenFunction::EmitAutoVarAlloca(), clang::ASTContext::getConstantArrayType(), clang::CodeGen::CodeGenModule::getOrCreateStaticVarDecl(), HandleSizeof(), and clang::ento::ExprEngine::VisitUnaryExprOrTypeTraitExpr(). Definition at line 6456 of file Type.h. Definition at line 6401 of file Type.h. Definition at line 6373 of file Type.h. Whether this type is a dependent type, meaning that its definition somehow depends on a template parameter (C++ [temp.dep.type]). Definition at line 2088 of file Type.h. Referenced by clang::Sema::ActOnCaseExpr(), clang::Sema::ActOnCXXDelete(), clang::Sema::ActOnDependentMemberExpr(), clang::Sema::ActOnFinishCXXInClassMemberInitializer(), clang::Sema::ActOnIdExpression(), clang::Sema::ActOnInitializerError(), clang::Sema::ActOnMemberAccessExpr(), clang::Sema::ActOnObjCAtSynchronizedOperand(), clang::Sema::ActOnPseudoDestructorExpr(), clang::Sema::ActOnStartCXXMemberReference(), clang::Sema::ActOnStartOfObjCMethodDef(), clang::Sema::ActOnUninitializedDecl(), addExceptionSpec(), clang::Sema::AddInitializerToDecl(), AddRecordMembersCompletionResults(), clang::TemplateSpecializationType::anyDependentTemplateArguments(), clang::Sema::BuildArrayTypeTrait(), clang::Sema::BuildAtomicType(), clang::Sema::BuildBaseInitializer(), clang::Sema::BuildClassMessage(), clang::Sema::buildCoroutinePromise(), clang::Sema::BuildCoyieldExpr(), clang::Sema::BuildCXXNamedCast(), clang::Sema::BuildCXXTypeConstructExpr(), clang::Sema::BuildCXXUuidof(), buildDeclareReductionRef(), clang::Sema::BuildExtVectorType(), clang::Sema::buildLambdaScope(), clang::Sema::BuildMemberInitializer(), clang::Sema::BuildMemberPointerType(), clang::Sema::BuildMemberReferenceExpr(), clang::Sema::BuildObjCAtThrowStmt(), clang::Sema::BuildObjCBridgedCast(), clang::Sema::BuildObjCEncodeExpression(), clang::Sema::BuildObjCExceptionDecl(), clang::Sema::BuildPseudoDestructorExpr(), clang::Sema::BuildQualifiedType(), clang::Sema::BuildResolvedCoawaitExpr(), clang::Sema::BuildUnaryTransformType(), buildUserDefinedMapperRef(), clang::Sema::BuildVectorType(), clang::Sema::canFullyTypeCheckRedeclaration(), canRecoverDotPseudoDestructorCallsOnPointerObjects(), clang::Sema::canThrow(), clang::Sema::CheckAllocatedType(), checkArithmeticIncompletePointerType(), clang::Sema::CheckBaseSpecifier(), clang::Sema::CheckCastAlign(), clang::Sema::CheckCompleteDecompositionDeclaration(), clang::Sema::CheckConstexprFunctionBody(), clang::Sema::CheckConstexprFunctionDecl(), clang::Sema::CheckConversionDeclarator(), clang::Sema::CheckEnumRedeclaration(), clang::Sema::CheckEnumUnderlyingType(), CheckImplicitConversion(), clang::Sema::CheckNonDependentConversions(), clang::Sema::CheckNontrivialField(), clang::Sema::CheckNonTypeTemplateParameterType(), CheckOperatorNewDeleteTypes(), clang::Sema::CheckOverload(), clang::Sema::CheckOverloadedOperatorDeclaration(), clang::Sema::CheckOverrideControl(), clang::Sema::CheckQualifiedMemberReference(), clang::Sema::CheckTemplateArgument(), clang::Sema::CheckUnaryExprOrTypeTraitOperand(), classifyPointerDeclarator(), clang::Sema::computeDeclContext(), computeDeclRefDependence(), clang::CoroutineSuspendExpr::CoroutineSuspendExpr(), clang::ExprWithCleanups::Create(), clang::Sema::CreateBuiltinArraySubscriptExpr(), clang::OffsetOfExpr::CreateEmpty(), clang::Sema::CreateUnaryExprOrTypeTraitExpr(), clang::CXXInheritedCtorInitExpr::CXXInheritedCtorInitExpr(), clang::Sema::DeduceAutoType(), clang::Sema::deduceClosureReturnType(), clang::DeducedType::DeducedType(), DeduceFromInitializerList(), deduceOpenCLImplicitAddrSpace(), clang::DependentCoawaitExpr::DependentCoawaitExpr(), clang::Sema::DiagnoseSizeOfParametersAndReturnValue(), clang::Sema::DiagnoseUnusedNestedTypedefs(), EvaluateArrayTypeTrait(), EvaluateBinaryTypeTrait(), EvaluateBuiltinClassifyType(), EvaluateUnaryTypeTrait(), clang::Sema::FillInlineAsmIdentifierInfo(), findTemplateParameter(), FormatFunctionParameter(), clang::CXXScalarValueInitExpr::getBeginLoc(), clang::Expr::getBestDynamicClassType(), clang::LambdaCapture::getCaptureKind(), clang::ASTContext::getConstantArrayType(), clang::ento::CallEvent::getDeclaredResultType(), clang::CXXDeleteExpr::getDestroyedType(), clang::DeclRefExpr::getEndLoc(), clang::ASTContext::getExtVectorType(), clang::FunctionType::getNameForCallConv(), clang::ObjCPropertyRefExpr::getReceiverType(), clang::ASTContext::getTypeSizeInCharsIfKnown(), clang::ASTContext::getUnaryTransformType(), getVisibilityOf(), handleObjCOwnershipTypeAttr(), HandleSizeof(), hasDeducibleTemplateParameters(), hasDependentAlignment(), hasOnlyNonStaticMemberFunctions(), clang::InitializationSequence::InitializeFrom(), clang::Sema::isAcceptableNestedNameSpecifier(), isConstantSizeType(), clang::Sema::isCopyElisionCandidate(), clang::QualType::isCXX11PODType(), clang::NestedNameSpecifier::isDependent(), clang::TemplateArgument::isDependent(), clang::DeclarationName::isDependentName(), IsDerivedFromInclusive(), IsImplicitBoolFloatConversion(), isLiteralType(), isObjCClassOrClassKindOfType(), isObjCReceiverType(), isOverflowingIntegerType(), isPromotableIntegerType(), isStandardLayoutType(), clang::PackExpansionType::isSugared(), clang::QualType::isTriviallyCopyableType(), clang::QualType::isTrivialType(), isTypeSubstitutable(), LookupDirect(), clang::Sema::LookupInlineAsmIdentifier(), clang::Sema::LookupInlineAsmVarDeclField(), LookupMemberExpr(), LookupVisibleDecls(), mangleAArch64VectorBase(), MarkUsedTemplateParameters(), MatchTemplateParameterKind(), noteMemberDeclaredHere(), clang::InitializationSequence::Perform(), processTypeAttrs(), clang::TreeTransform< Derived >::RebuildQualifiedType(), clang::Sema::RebuildTypeInCurrentInstantiation(), clang::Sema::RequireLiteralType(), clang::Sema::SemaConvertVectorExpr(), clang::CXXRecordDecl::setBases(), clang::MaterializeTemporaryExpr::setExtendingDecl(), clang::Sema::SubstAutoType(), clang::Sema::SubstAutoTypeSourceInfo(), clang::TreeTransform< Derived >::TransformCXXNamedCastExpr(), clang::TreeTransform< Derived >::TransformExceptionSpec(), clang::TreeTransform< Derived >::TransformNestedNameSpecifierLoc(), TryAddressSpaceCast(), clang::TypoExpr::TypoExpr(), VariableCanNeverBeAConstantExpression(), clang::Sema::VerifyBitField(), clang::TextNodeDumper::Visit(), clang::ASTTypeWriter::VisitTagType(), and warnAboutRedundantParens(). Determine wither this type is a C++ elaborated-type-specifier. Definition at line 2709 of file Type.cpp. Referenced by clang::Sema::ActOnFriendTypeDecl(), and clang::Sema::CheckFriendTypeDecl(). Definition at line 6385 of file Type.h. Referenced by AnalyzeBitFieldAssignment(), clang::Sema::BuildUnaryTransformType(), checkArithmeticOrEnumeralCompare(), checkArithmeticOrEnumeralThreeWayCompare(), clang::Sema::CheckCompareOperands(), checkIntToPointerCast(), clang::Sema::CheckOverloadedOperatorDeclaration(), CheckTautologicalComparison(), checkVAStartIsInVariadicFunction(), clang::Sema::CodeCompleteCase(), DiagnoseBadFunctionCast(), EvaluateUnaryTypeTrait(), clang::QualType::getBaseTypeIdentifier(), HasEnumType(), is32Or64BitBasicType(), clang::Sema::IsIntegralPromotion(), clang::Expr::isNullPointerConstant(), clang::ento::isPrimitiveType(), clang::ASTContext::isPromotableBitField(), clang::Sema::PerformOpenMPImplicitIntegerConversion(), rewriteInputConstraintReferences(), clang::TreeTransform< Derived >::TransformNestedNameSpecifierLoc(), and TryStaticCast(). Definition at line 6470 of file Type.h. Referenced by DiagnoseBadFunctionCast(), IsStandardConversion(), clang::CodeGen::CodeGenFunction::ShouldNullCheckClassCastValue(), and TryOCLZeroOpaqueTypeInitialization(). Definition at line 6397 of file Type.h. Referenced by clang::Sema::areLaxCompatibleVectorTypes(), clang::Sema::CheckExtVectorCast(), checkFoundationAPI(), clang::Sema::checkOpenCLDisabledTypeDeclSpec(), createBinOpInfoFromIncDec(), DiagnoseBadFunctionCast(), EvaluateUnaryTypeTrait(), IsVectorConversion(), LookupMemberExpr(), and clang::Sema::prepareVectorSplat(). Return true if this is a fixed point or integer type. Definition at line 6615 of file Type.h. Return true if this is a fixed point type according to ISO/IEC JTC1 SC22 WG14 N1169. Definition at line 6607 of file Type.h. Referenced by CheckImplicitConversion(), Evaluate(), EvaluateAsFixedPoint(), EvaluateComparisonBinaryOperator(), EvaluateFixedPoint(), EvaluateFixedPointOrInteger(), clang::FixedPointLiteral::FixedPointLiteral(), clang::ASTContext::getCorrespondingSaturatedType(), clang::ASTContext::getFixedPointIBits(), clang::ASTContext::getFixedPointMax(), clang::ASTContext::getFixedPointMin(), clang::ASTContext::getFixedPointScale(), clang::ASTContext::getFixedPointSemantics(), handleFixedPointConversion(), and clang::CodeGen::CodeGenFunction::ShouldNullCheckClassCastValue(). Definition at line 6579 of file Type.h. Definition at line 6573 of file Type.h. Definition at line 1943 of file Type.cpp. Referenced by clang::ento::StoreManager::CastRetrievedVal(), checkCondition(), DiagnoseBadFunctionCast(), clang::CodeGen::CodeGenFunction::EmitCheckTypeDescriptor(), EmitX86_64VAArgFromMemory(), EvaluateBuiltinConstantP(), EvaluateUnaryTypeTrait(), findCompleteObject(), getAArch64PBV(), clang::UserDefinedLiteral::getLiteralOperatorKind(), hasFloatingRepresentation(), clang::Sema::prepareVectorSplat(), rewriteToNumberLiteral(), and TryListInitialization(). Whether this type comes from an AST file. Definition at line 1823 of file Type.h. Definition at line 1955 of file Type.h. Definition at line 6332 of file Type.h. Referenced by BuildUniqueMethodName(), CanThrow(), clang::Sema::DiagnoseAssignmentResult(), DiagnoseCallingConvCast(), clang::CodeGen::CodeGenFunction::EmitCall(), clang::ento::SValBuilder::evalCast(), clang::Decl::getFunctionType(), HandleConstructorCall(), isCallback(), clang::comments::Sema::isFunctionOrBlockPointerVarLikeDecl(), clang::comments::Sema::isFunctionOrMethodVariadic(), clang::comments::Sema::isFunctionPointerVarDecl(), ResolveOverloadForDeduction(), RewriteOneForwardClassDecl(), rewriteToObjCProperty(), SemaBuiltinLaunder(), TryConstCast(), TryReinterpretCast(), and TypeIsInnerPointer(). Definition at line 1956 of file Type.h. Referenced by CreateNewFunctionDecl(), clang::MemberPointerType::isMemberDataPointer(), and clang::MemberPointerType::isMemberFunctionPointer(). Definition at line 6304 of file Type.h. Referenced by clang::Sema::ActOnCXXDelete(), clang::Sema::ActOnExplicitInstantiation(), clang::Sema::ActOnFriendFunctionDecl(), AdjustFunctionParmAndArgTypesForDeduction(), clang::Sema::BuildAtomicType(), clang::Sema::BuildBlockPointerType(), clang::Sema::BuildCXXTypeConstructExpr(), clang::Sema::BuildMemberPointerType(), clang::Sema::BuildPointerType(), clang::Sema::CallExprUnaryConversions(), clang::Sema::CheckAllocatedType(), checkArithmeticBinOpPointerOperands(), checkArithmeticOpPointerOperand(), clang::Sema::CheckConditionVariable(), clang::Sema::CheckFunctionReturnType(), clang::Sema::CheckMain(), clang::Sema::CheckMSVCRTEntryPoint(), clang::Sema::CheckNonTypeTemplateParameterType(), clang::Sema::CheckPointerToMemberOperands(), clang::Sema::CheckSpecifiedExceptionType(), CheckTemplateArgumentIsCompatibleWithParameter(), ClassifyBinaryOp(), createBinOpInfoFromIncDec(), DeduceTemplateArgumentsByTypeMatch(), clang::Sema::DefaultFunctionArrayConversion(), determineEndOffset(), clang::CodeGen::CodeGenFunction::EmitCallee(), clang::CodeGen::CodeGenFunction::EmitLoadOfLValue(), emitPointerArithmetic(), clang::CodeGen::CodeGenFunction::EmitReferenceBindingToExpr(), clang::ento::SValBuilder::evalCast(), Evaluate(), EvaluateBinaryTypeTrait(), EvaluateLValue(), evaluateTypeTrait(), EvaluateUnaryTypeTrait(), clang::Sema::FillInlineAsmIdentifierInfo(), clang::Expr::findBoundMemberType(), FindConversionForRefInit(), clang::ASTContext::getAdjustedParameterType(), clang::ASTContext::getBlockPointerType(), clang::ASTContext::getDecayedType(), clang::ASTContext::getDeclAlign(), clang::ASTContext::getExceptionObjectType(), clang::getParameterABISpelling(), HandleAddressSpaceTypeAttribute(), HandleSizeof(), clang::Sema::IgnoredValueConversions(), clang::TemplateDeclInstantiator::InstantiateVarTemplatePartialSpecialization(), clang::Declarator::isDeclarationOfFunction(), IsModifiable(), clang::ento::isPrimitiveType(), IsStandardConversion(), clang::Sema::LookupInlineAsmIdentifier(), LookupMemberExpr(), maybeSynthesizeBlockSignature(), clang::ASTContext::mergeObjCGCQualifiers(), clang::Sema::PerformMemberExprBaseConversion(), clang::TreeTransform< Derived >::RebuildQualifiedType(), ResolveOverloadForDeduction(), SemaBuiltinLaunder(), clang::CodeGen::CodeGenFunction::OpaqueValueMappingData::shouldBindAsLValue(), TryReferenceInit(), TryReferenceInitializationCore(), TryStaticCast(), clang::TemplateDeclInstantiator::VisitVarDecl(), and clang::TemplateDeclInstantiator::VisitVarTemplateSpecializationDecl(). Tests whether the type is categorized as a fundamental type. True for types specified in C++0x [basic.fundamental]. Definition at line 6272 of file Type.h. Definition at line 6566 of file Type.h. Referenced by clang::Sema::CheckAssignmentOperands(), clang::Sema::CheckFunctionReturnType(), createBinOpInfoFromIncDec(), DiagnoseBadFunctionCast(), clang::Sema::PerformImplicitConversion(), and clang::Sema::UsualUnaryConversions(). Definition at line 6486 of file Type.h. Referenced by clang::Sema::CreateBuiltinBinOp(), clang::Sema::CreateBuiltinUnaryOp(), and HandleOpenCLAccessAttr(). Definition at line 6365 of file Type.h. Referenced by AdjustFunctionParmAndArgTypesForDeduction(), clang::Sema::BuildArrayType(), CheckUnaryTypeTraitTypeCompleteness(), computeDeclRefDependence(), EvaluateBinaryTypeTrait(), evaluateTypeTrait(), getAccessFlag(), clang::ASTContext::getObjCEncodingTypeSize(), hasCompatibleArrayTypes(), hasDefaultSetterName(), isDesignatorAtObjectEnd(), isSameEntity(), IsVariableSizedType(), clang::InitializationSequence::Perform(), clang::Sema::RequireCompleteExprType(), and roundUpSizeToCharAlignment(). Return true if this is an incomplete or object type, in other words, not a function type. Definition at line 1870 of file Type.h. Referenced by clang::Sema::BuildQualifiedType(), checkConditionalObjectPointersCompatibility(), and TryStaticCast(). Types are partitioned into 3 broad categories (C99 6.2.5p1): object types, function types, and incomplete types. Return true if this is an incomplete type. A type that can describe objects, but which lacks information needed to determine its size (e.g. void, or a fwd declared struct). Clients of this routine will need to determine if the size is actually required. Def If non-null, and the type refers to some kind of declaration that can be completed (such as a C struct, C++ class, or Objective-C class), will be set to the declaration. a type that can describe objects, but which lacks information needed to determine its size. Definition at line 2053 of file Type.cpp. References clang::Decl::getASTContext(), clang::ObjCObjectType::getBaseType(), clang::TargetInfo::getCXXABI(), clang::CXXRecordDecl::getMostRecentNonInjectedDecl(), clang::ASTContext::getTargetInfo(), clang::Decl::hasAttr(), clang::ObjCInterfaceDecl::hasDefinition(), clang::EnumDecl::isComplete(), clang::TagDecl::isCompleteDefinition(), isIncompleteType(), clang::TargetCXXABI::isMicrosoft(), and isVoidType(). Referenced by addValue(), clang::Sema::BuildUnaryTransformType(), calculateOffset(), clang::ento::StoreManager::castRegion(), clang::Sema::CheckCallReturnType(), clang::Sema::CheckCastAlign(), clang::Sema::checkDeclIsAllowedInOpenMPTarget(), clang::Sema::CheckSubscriptingKind(), checkTypeMappable(), clang::CodeGen::CodeGenModule::ConstructAttributeList(), determineEndOffset(), DiagnoseForRangeVariableCopies(), clang::Sema::DiscardMisalignedMemberAddress(), clang::CodeGen::CodeGenFunction::EmitTypeCheck(), EvaluateComparisonBinaryOperator(), evaluateTypeTrait(), EvaluateUnaryTypeTrait(), evenFlexibleArraySize(), clang::CodeGen::CodeGenTBAA::getAccessInfo(), GetAlignOfExpr(), clang::ento::ElementRegion::getAsArrayOffset(), clang::ASTContext::getConstantArrayType(), clang::ento::TypedValueRegion::getExtent(), clang::CodeGen::CodeGenFunction::getNaturalTypeAlignment(), clang::ASTContext::getObjCEncodingTypeSize(), clang::ASTContext::getTypeAlignIfKnown(), clang::ASTContext::getTypeSizeInCharsIfKnown(), hasDefaultSetterName(), isConstantSizeType(), clang::QualType::isCXX11PODType(), isEnableIf(), clang::CodeGen::CodeGenTypes::isFuncParamTypeConvertible(), isIncompleteType(), isLiteralType(), isOnePastTheEndOfCompleteObject(), isPreferredLookupResult(), isStandardLayoutType(), clang::QualType::isTriviallyCopyableType(), clang::Sema::isValidVarArgType(), isZeroSized(), matchTypes(), clang::CodeGen::CodeGenModule::maybeSetTrivialComdat(), tryEvaluateBuiltinObjectSize(), and clang::ento::ExprEngine::VisitUnaryExprOrTypeTraitExpr(). Determine whether this type is an instantiation-dependent type, meaning that the type involves a template parameter (even if the definition does not actually depend on the type substituted for that template parameter). Definition at line 2094 of file Type.h. Referenced by clang::TemplateSpecializationType::anyDependentTemplateArguments(), buildDeclareReductionRef(), buildUserDefinedMapperRef(), computeCachedProperties(), computeDeclRefDependence(), clang::LinkageComputer::computeTypeLinkageInfo(), clang::OffsetOfExpr::CreateEmpty(), clang::DeducedType::DeducedType(), clang::CXXScalarValueInitExpr::getBeginLoc(), clang::DeclRefExpr::getEndLoc(), clang::FunctionType::getNameForCallConv(), clang::ObjCPropertyRefExpr::getReceiverType(), hasOnlyNonStaticMemberFunctions(), clang::TemplateDeclInstantiator::InstantiateTypedefNameDecl(), clang::NestedNameSpecifier::isInstantiationDependent(), clang::TemplateArgument::isInstantiationDependent(), isObjCClassOrClassKindOfType(), isTypeSubstitutable(), NeedsInstantiationAsFunctionType(), clang::MaterializeTemporaryExpr::setExtendingDecl(), SubstDefaultTemplateArgument(), clang::Sema::SubstType(), clang::TextNodeDumper::Visit(), and clang::TemplateDeclInstantiator::VisitVarDecl(). isIntegerType() does not include complex integers (a GCC extension). Definition at line 6594 of file Type.h. Referenced by clang::Sema::ActOnSEHExceptBlock(), clang::Sema::BuildExtVectorType(), clang::Sema::BuildVectorType(), castValueToType(), checkBuiltinArgument(), CheckImplicitConversion(), CheckIncrementDecrementOperand(), clang::Sema::CheckLoopHintExpr(), checkOpenCLConditionVector(), checkOpenCLEnqueueIntType(), clang::Sema::CheckRemainderOperands(), convertVector(), create_dispatch_once(), createBinOpInfoFromIncDec(), DiagnoseBadFunctionCast(), clang::Sema::DiscardMisalignedMemberAddress(), clang::CodeGen::CodeGenFunction::EmitCheckTypeDescriptor(), EmitIntegerTruncationCheckHelper(), clang::CodeGen::CodeGenFunction::EmitLoadOfGlobalRegLValue(), clang::CodeGen::CodeGenFunction::EmitStoreThroughGlobalRegLValue(), EmitX86_64VAArgFromMemory(), EvaluateComplex(), EvaluateFixedPointOrInteger(), EvaluateVector(), getAArch64PBV(), clang::ASTContext::getFixedPointSemantics(), getIntegerWidthAndSignedness(), clang::UserDefinedLiteral::getLiteralOperatorKind(), getUsualDeleteParams(), handleAssignment(), handleCompoundAssignment(), hasIntegerRepresentation(), clang::IntegerLiteral::IntegerLiteral(), isAcceptableMethodMismatch(), isKnownToHaveUnsignedValue(), clang::BinaryOperator::isNullPointerArithmeticExtension(), clang::InitListExpr::isStringLiteralInit(), isValidOrderingForOp(), LazyInitialize(), OpenCLArithmeticConversions(), clang::Sema::PerformImplicitConversion(), SemaBuiltinReserveRWPipe(), SemaBuiltinRWPipe(), SemaOpenCLBuiltinEnqueueKernel(), clang::CodeGen::CodeGenFunction::ShouldNullCheckClassCastValue(), and tryVectorConvertAndSplat(). Determine whether this type is an integral or enumeration type. Definition at line 6664 of file Type.h. Referenced by clang::Sema::ActOnStartOfSwitchStmt(), clang::ento::RangedConstraintManager::assumeSymUnsupported(), checkArithmeticOrEnumeralThreeWayCompare(), clang::Sema::CheckConvertedConstantExpression(), CheckICE(), CheckKeyForObjCARCConversion(), clang::Sema::CheckNonTypeTemplateParameterType(), clang::Sema::CheckSubscriptingKind(), conjureOffsetSymbolOnLocation(), clang::ento::SMTConv::doTypeConversion(), EmitCompare(), emitReplacement(), clang::ento::SValBuilder::evalCast(), Evaluate(), EvaluateAsInt(), EvaluateBuiltinConstantP(), EvaluateComparisonBinaryOperator(), EvaluateIntegerOrLValue(), findCompleteObject(), clang::ento::SMTConv::fromCast(), getAbsoluteValueKind(), clang::ento::BasicValueFactory::getAPSIntType(), GetCFNumberSize(), clang::CodeGen::ABIArgInfo::getExtend(), clang::ASTContext::getObjCEncodingTypeSize(), clang::CodeGen::ABIArgInfo::getSignExtend(), clang::ento::ProgramState::getSValAsScalarOrLoc(), GetX86_64ByValArgumentPair(), clang::ento::SMTConv::getZeroExpr(), clang::CodeGen::ABIArgInfo::getZeroExtend(), clang::ASTContext::hasUniqueObjectRepresentations(), clang::ento::SValBuilder::haveSameType(), identifyCall(), clang::Expr::isKnownToHaveBooleanValue(), clang::ASTContext::isMSStaticDataMemberInlineDefinition(), isOnePastTheEndOfCompleteObject(), isRecordEmpty(), isRecordWithSSEVectorType(), clang::ento::SValBuilder::makeZeroVal(), clang::Sema::ICEConvertDiagnoser::match(), clang::Sema::prepareVectorSplat(), RecoverCastedSymbol(), TryListInitialization(), tryRearrange(), TryReinterpretCast(), TryStaticCast(), and clang::Sema::VerifyBitField(). Determine whether this type is an integral or unscoped enumeration type. Definition at line 1794 of file Type.cpp. Referenced by clang::Sema::CheckBitwiseOperands(), CheckConvertedConstantConversions(), diagnoseStringPlusInt(), EvaluateCPlusPlus11IntegralConstantExpr(), getIncrementedVar(), clang::StandardConversionSequence::getNarrowingKind(), isArithmeticArgumentPromotion(), IsStandardConversion(), and clang::Sema::ICEConvertDiagnoser::match(). Determine whether this type is an integral type. This routine determines whether the given type is an integral type per C++ [basic.fundamental]p7. Although the C standard does not define the term "integral type", it has a similar term "integer type", and in C++ the two terms are equivalent. However, C's "integer type" includes enumeration types, while C++'s "integer type" does not. The ASTContext parameter is used to determine whether we should be following the C or C++ rules when determining whether this type is an integral/integer type. For cases where C permits "an integer type" and C++ permits "an integral type", use this routine. For cases where C permits "an integer type" and C++ permits "an integral or enumeration type", use isIntegralOrEnumerationType() instead. Ctx The context in which this type occurs. true if the type is considered an integral type, false otherwise. Definition at line 1781 of file Type.cpp. Referenced by AnalyzeComparison(), checkIntToPointerCast(), clang::Sema::CheckObjCConversion(), clang::Sema::CheckVectorCast(), create_OSAtomicCompareAndSwap(), DiagnoseBadFunctionCast(), DiagnoseBinOpPrecedence(), EvaluateUnaryTypeTrait(), clang::StandardConversionSequence::getNarrowingKind(), IgnoreNoopCastsSingleStep(), IsStandardConversion(), tryGCCVectorConvertAndSplat(), TryReinterpretCast(), TryStaticCast(), and tryVectorConvertAndSplat(). Definition at line 455 of file Type.cpp. True if the computed linkage is valid. Used for consistency checking. Should always return true. Definition at line 3751 of file Type.cpp. References clang::LinkageComputer::computeTypeLinkageInfo(), getCanonicalTypeInternal(), clang::LinkageInfo::getLinkage(), and TypeBits. Definition at line 2365 of file Type.cpp. References getAs(), getBaseElementTypeUnsafe(), getCanonicalTypeInternal(), clang::ASTContext::getLangOpts(), isAnyComplexType(), isDependentType(), isIncompleteType(), isReferenceType(), isScalarType(), isVariableArrayType(), isVectorType(), and isVoidType(). Referenced by CheckLiteralType(), EvaluateObjectArgument(), EvaluateUnaryTypeTrait(), and clang::CXXRecordDecl::setBases(). Definition at line 6324 of file Type.h. Referenced by checkTupleLikeDecomposition(), ClassifyUnnamed(), clang::ExprWithCleanups::Create(), DeduceTemplateArgumentsByTypeMatch(), DiagnoseCastQual(), emitOutlinedFunctionPrologue(), EvaluateUnaryTypeTrait(), FindConversionForRefInit(), getCanonicalParamType(), clang::UserDefinedLiteral::getUDSuffix(), clang::ento::ExprEngine::handleLValueBitCast(), LookupMethodInReceiverType(), clang::InitializationSequence::Perform(), TryListConversion(), TryReferenceInitializationCore(), and TryRefInitWithConversionFunction(). Definition at line 6350 of file Type.h. Referenced by clang::CodeGen::CodeGenModule::EmitNullConstant(), EvaluateUnaryTypeTrait(), and hasDefaultSetterName(). Definition at line 6343 of file Type.h. Referenced by EvaluateUnaryTypeTrait(), isAggregateTypeForABI(), ResolveOverloadForDeduction(), and TryConstCast(). Definition at line 6339 of file Type.h. Referenced by AdjustFunctionParmAndArgTypesForDeduction(), clang::Sema::BuildQualifiedType(), CastsAwayConstness(), clang::Sema::CheckCompareOperands(), clang::Sema::CheckNonTypeTemplateParameterType(), checkNullabilityTypeSpecifier(), CheckTemplateArgumentPointerToMember(), CompareDerivedToBaseConversions(), convertPointersToCompositeType(), DiagnoseNullConversion(), EmitX86_64VAArgFromMemory(), clang::ento::SValBuilder::evalCast(), Evaluate(), EvaluateComparisonBinaryOperator(), EvaluateMemberPointer(), EvaluateUnaryTypeTrait(), clang::Sema::FindCompositePointerType(), clang::ento::ExprEngine::getInitialState(), clang::ASTContext::getPreferredTypeAlign(), clang::Sema::HandleFunctionTypeMismatch(), handleMSPointerTypeQualifierAttr(), clang::Sema::handlerCanCatch(), clang::ASTContext::hasUniqueObjectRepresentations(), clang::ento::isPrimitiveType(), IsStandardConversion(), rewriteInputConstraintReferences(), TryConstCast(), and TryReinterpretCast(). Test for a placeholder type other than Overload; see BuiltinType::isNonOverloadPlaceholderType. Definition at line 6554 of file Type.h. Referenced by clang::Sema::ActOnOMPArraySectionExpr(), and clang::Sema::DeduceAutoType(). Definition at line 6585 of file Type.h. Referenced by CheckConvertedConstantConversions(), clang::Sema::CheckNonTypeTemplateParameterType(), CheckTemplateArgumentAddressOfObjectOrFunction(), clang::ento::SValBuilder::conjureSymbolVal(), decomposeTypeForEH(), DiagnoseNullConversion(), clang::Sema::diagnoseZeroToNullptrConversion(), clang::ento::SMTConv::doTypeConversion(), EvaluateComparisonBinaryOperator(), clang::Sema::FindCompositePointerType(), clang::ento::SValBuilder::getConjuredHeapSymbolVal(), clang::ento::SValBuilder::getDerivedRegionValueSymbolVal(), clang::ento::SValBuilder::getRegionValueSymbolVal(), clang::ASTContext::getTargetNullPointerValue(), clang::Sema::handlerCanCatch(), clang::ento::Loc::isLocType(), isNullPointerValueTemplateArgument(), clang::ASTContext::isSentinelNullExpr(), IsStandardConversion(), clang::analyze_format_string::ArgType::matchesType(), and TryReinterpretCast(). Determine whether the given type T is a "bridgable" Objective-C type, which is either an Objective-C object pointer type or an. Definition at line 4029 of file Type.cpp. Referenced by clang::Sema::BuildObjCBridgedCast(), and classifyTypeForARCConversion(). Determines if this type, which must satisfy isObjCLifetimeType(), is implicitly __unsafe_unretained rather than implicitly __strong. Definition at line 3962 of file Type.cpp. References getCanonicalTypeInternal(), clang::QualType::getTypePtr(), and isObjCLifetimeType(). Referenced by getObjCARCImplicitLifetime(), inferARCWriteback(), and clang::Sema::MaybeBindToTemporary(). Definition at line 449 of file Type.cpp. Definition at line 6452 of file Type.h. Referenced by AuditedType(), clang::ASTContext::canAssignObjCInterfacesInBlockPointer(), checkObjCPointerTypesForAssignment(), and TypeIsInnerPointer(). Whether the type is Objective-C 'Class' or a __kindof type of an Class type, e.g., __kindof Class <NSCopying>. Unlike isObjCIdOrObjectKindOfType, there is no relevant bound here because Objective-C's type system cannot express "a class object for a subclass of NSFoo". Definition at line 586 of file Type.cpp. References clang::initialize(), isDependentType(), isInstantiationDependentType(), isVariablyModifiedType(), and Type(). Definition at line 6440 of file Type.h. Referenced by clang::ASTContext::applyObjCProtocolQualifiers(), checkObjCPointerTypesForAssignment(), clang::Sema::FindCompositeObjCPointerType(), findMethodDecl(), clang::Sema::getMessageSendResultType(), clang::ASTContext::ObjCQualifiedIdTypesAreCompatible(), clang::Sema::SelectorsForTypoCorrection(), and splitAccordingToPolicy(). Whether the type is Objective-C 'id' or a __kindof type of an object type, e.g., __kindof NSView * or __kindof id <NSCopying>. bound Will be set to the bound on non-id subtype types, which will be (possibly specialized) Objective-C class type, or null for 'id. Definition at line 560 of file Type.cpp. Definition at line 6434 of file Type.h. Referenced by clang::ASTContext::applyObjCProtocolQualifiers(), clang::Sema::BuildObjCExceptionDecl(), CheckKeyForObjCARCConversion(), CheckObjCBridgeCFCast(), CheckObjCBridgeNSCast(), clang::Sema::CheckSubscriptingKind(), findMethodDecl(), clang::ObjCMethodDecl::getMethodFamily(), isObjCReceiverType(), isOSObjectRelated(), IsValidIdentifier(), clang::ASTContext::mergeTypes(), clang::ASTContext::ObjCQualifiedIdTypesAreCompatible(), ReplaceWithClasstype(), clang::Sema::SelectorsForTypoCorrection(), and splitAccordingToPolicy(). Definition at line 3994 of file Type.cpp. Definition at line 4006 of file Type.cpp. Was this type written with the special inert-in-ARC __unsafe_unretained qualifier? This approximates the answer to the following question: if this translation unit were compiled in ARC, would this type be qualified with __unsafe_unretained? Definition at line 2005 of file Type.h. Returns true if objects of this type have lifetime semantics under ARC. Definition at line 4020 of file Type.cpp. Referenced by clang::Sema::CheckAllocatedType(), clang::Sema::CheckParameter(), createObjCPropertyGetter(), DiagnoseBadFunctionCast(), EvaluateUnaryTypeTrait(), clang::Sema::inferObjCARCLifetime(), isObjCARCImplicitlyUnretainedType(), isObjCIndirectLifetimeType(), and clang::TreeTransform< Derived >::RebuildQualifiedType(). Definition at line 3981 of file Type.cpp. Referenced by clang::ASTContext::isObjCNSObjectType(), and isObjCRetainableType(). Definition at line 6413 of file Type.h. Referenced by clang::Sema::ActOnStartCXXMemberReference(), and clang::Sema::CodeCompleteMemberReferenceExpr(). Definition at line 6405 of file Type.h. Referenced by clang::Sema::ActOnObjCAtSynchronizedOperand(), clang::Sema::ActOnStartCXXMemberReference(), AdjustFunctionParmAndArgTypesForDeduction(), adjustReturnValue(), AuditedType(), clang::ASTContext::BlockRequiresCopying(), clang::Sema::BuildObjCAtThrowStmt(), clang::Sema::BuildObjCExceptionDecl(), clang::Sema::BuildQualifiedType(), clang::ento::StoreManager::castRegion(), clang::Sema::CheckAdditionOperands(), checkFormatStringExpr(), CheckKeyForObjCARCConversion(), clang::Sema::CheckMessageArgumentTypes(), checkNullabilityTypeSpecifier(), CheckObjCCollectionLiteralElement(), checkObjCPointerIntrospection(), clang::ento::retaincountchecker::RetainCountChecker::checkPostStmt(), clang::Sema::CheckSubscriptingKind(), clang::Sema::CodeCompleteMemberReferenceExpr(), clang::Sema::DiagnoseAssignmentResult(), clang::ento::SMTConv::doTypeConversion(), clang::CodeGen::CodeGenFunction::EmitAutoVarAlloca(), emitBadConversionNotes(), clang::CodeGen::CodeGenFunction::EmitCXXThrowExpr(), clang::CodeGen::CodeGenFunction::EmitPointerWithAlignment(), clang::CodeGen::CodeGenModule::GetAddrOfRTTIDescriptor(), clang::ASTContext::getByrefLifetime(), GetGCAttrTypeForType(), clang::ASTContext::getObjCGCAttrKind(), clang::ASTContext::getUnqualifiedObjCPointerType(), handleObjCGCTypeAttr(), hasIsEqualMethod(), clang::ento::cocoa::isCocoaObjectRef(), isObjCARCBridgableType(), isObjCReceiverType(), isObjCRetainableType(), clang::Sema::IsPointerConversion(), LookThroughTransitiveAssignmentsAndCommaOperators(), clang::analyze_format_string::ArgType::matchesType(), clang::ASTContext::mergeObjCGCQualifiers(), clang::ASTContext::mergeTypes(), objectifyExpr(), clang::Sema::PerformImplicitConversion(), clang::Sema::PrepareCastToObjCObjectPointer(), clang::TreeTransform< Derived >::RebuildCXXForRangeStmt(), scanToNextArgument(), clang::Sema::SelectorsForTypoCorrection(), TryConstCast(), tryEmitSpecializedAllocInit(), tryGenerateSpecializedMessageSend(), TryReinterpretCast(), TryStaticCast(), and TypeIsInnerPointer(). Definition at line 6409 of file Type.h. Referenced by clang::Sema::ActOnCompatibilityAlias(), clang::Sema::ActOnForwardClassDeclaration(), clang::Sema::ActOnTypedefedProtocols(), clang::ASTContext::applyObjCProtocolQualifiers(), clang::Sema::BuildPointerType(), CastsAwayConstness(), clang::Sema::CheckFunctionReturnType(), clang::Sema::CheckVariableDeclarationType(), clang::Sema::checkVariadicArgument(), inferARCWriteback(), isArithmeticArgumentPromotion(), isObjCReceiverType(), clang::Sema::isValidVarArgType(), and transferARCOwnership(). Definition at line 6428 of file Type.h. Referenced by checkObjCPointerTypesForAssignment(), clang::Sema::SelectorsForTypoCorrection(), and splitAccordingToPolicy(). Definition at line 6422 of file Type.h. Referenced by clang::Sema::BuildObjCExceptionDecl(), checkObjCPointerTypesForAssignment(), clang::ASTContext::ObjCObjectAdoptsQTypeProtocols(), clang::ASTContext::QIdProtocolsAdoptObjCObjectProtocols(), RewriteOneForwardClassDecl(), scanToNextArgument(), clang::Sema::SelectorsForTypoCorrection(), and splitAccordingToPolicy(). Definition at line 1580 of file Type.cpp. Definition at line 4000 of file Type.cpp. References isBlockPointerType(), isObjCNSObjectType(), and isObjCObjectPointerType(). Referenced by AdjustObjCObjectType(), clang::ASTContext::BlockRequiresCopying(), checkAllAtProps(), clang::ento::retaincountchecker::RetainCountChecker::checkPostStmt(), clang::Sema::checkUnsafeExprAssigns(), checkWeakGCAttrs(), computeBlockInfo(), computeCopyInfoForBlockCapture(), computeDestroyInfoForBlockCapture(), errorForGCAttrsOnNonObjC(), findWeakLValue(), clang::analyze_printf::PrintfSpecifier::fixType(), getImpliedARCOwnership(), handleObjCOwnershipTypeAttr(), inferARCWriteback(), isObjCLifetimeType(), isSynthesizedRetainableProperty(), IsValidIdentifier(), clang::Sema::MaybeBindToTemporary(), MaybeProduceObjCObject(), PropertyMemoryAttribute(), clang::CodeGen::CodeGenFunction::StartFunction(), transferARCOwnership(), and transferARCOwnershipToDeclSpec(). Definition at line 6446 of file Type.h. Referenced by clang::ObjCMethodDecl::getMethodFamily(), isCallback(), and LookupMemberExpr(). Determine whether this type is an object type. Definition at line 1875 of file Type.h. Referenced by decomposeTypeForEH(), EvaluateBinaryTypeTrait(), evaluateTypeTrait(), EvaluateUnaryTypeTrait(), clang::Sema::handlerCanCatch(), and SemaBuiltinLaunder(). Definition at line 6511 of file Type.h. Definition at line 6503 of file Type.h. Referenced by clang::CodeGen::CodeGenFunction::ShouldNullCheckClassCastValue(), and TryOCLZeroOpaqueTypeInitialization(). Definition at line 6518 of file Type.h. Referenced by clang::CodeGen::CGOpenCLRuntime::convertOpenCLSpecificType(), and isTypeSubstitutable(). Determines whether this is a type for which one can define an overloaded operator. Definition at line 6690 of file Type.h. Referenced by clang::Sema::BuildBinOp(), clang::Sema::BuildUnaryOp(), and clang::TreeTransform< Derived >::RebuildCXXOperatorCallExpr(). Definition at line 6493 of file Type.h. Referenced by checkOpenCLPipeArg(), clang::Sema::CreateBuiltinBinOp(), clang::Sema::CreateBuiltinUnaryOp(), HandleOpenCLAccessAttr(), and SemaBuiltinPipePackets(). Test for a type which does not represent an actual type-system type but is instead used as a placeholder for various convenient purposes within Clang. All such types are BuiltinTypes. Definition at line 6534 of file Type.h. Referenced by clang::Sema::ActOnOMPArraySectionExpr(), clang::Sema::BuildCoreturnStmt(), clang::Sema::BuildCoyieldExpr(), clang::Sema::BuildCXXTypeId(), clang::Sema::BuildExpressionTrait(), clang::Sema::BuildResolvedCoawaitExpr(), clang::Sema::BuildUnresolvedCoawaitExpr(), DeduceTemplateArgumentsByTypeMatch(), clang::Sema::DefaultFunctionArrayConversion(), clang::Sema::DefaultLvalueConversion(), and DiagnoseBadFunctionCast(). Definition at line 6308 of file Type.h. Referenced by clang::Sema::ActOnOpenMPAlignedClause(), clang::Sema::ActOnOpenMPDeclareSimdDirective(), clang::Sema::ActOnOpenMPIsDevicePtrClause(), clang::Sema::ActOnOpenMPUseDevicePtrClause(), clang::Sema::ActOnStartCXXMemberReference(), clang::Sema::AddFunctionCandidates(), AdjustFunctionParmAndArgTypesForDeduction(), assumeNoOverflow(), clang::Sema::BuildAnonymousStructUnionMemberReference(), buildCapture(), clang::Sema::BuildMemberReferenceExpr(), clang::Sema::BuildPseudoDestructorExpr(), clang::ento::StoreManager::CastRetrievedVal(), castToBase(), clang::Sema::CheckAdditionOperands(), checkArrayExpressionDoesNotReferToWholeSize(), clang::Sema::CheckCompareOperands(), clang::Sema::CheckConditionalOperands(), CheckImplicitConversion(), clang::Sema::CheckNonTypeTemplateParameterType(), checkPointerIntegerMismatch(), CheckTemplateArgumentAddressOfObjectOrFunction(), CheckTemplateArgumentIsCompatibleWithParameter(), clang::Sema::CheckTransparentUnionArgumentConstraints(), ClassifyDiagnostic(), CompareDerivedToBaseConversions(), convertPointersToCompositeType(), decomposeTypeForEH(), describeUninitializedArgumentInCall(), DiagnoseDivisionSizeofPointer(), diagnoseObjCARCConversion(), clang::Sema::DiscardMisalignedMemberAddress(), EmitAtomicCmpXchgForMSIntrin(), EmitAtomicDecrementValue(), clang::CodeGen::CodeGenFunction::EmitAtomicExpr(), EmitAtomicIncrementValue(), EmitBinaryAtomicPost(), EmitCompare(), clang::CodeGen::CodeGenFunction::EmitDynamicCast(), EmitDynamicCastToNull(), clang::CodeGen::CodeGenFunction::EmitLoadOfGlobalRegLValue(), clang::CodeGen::CodeGenFunction::EmitOMPArraySectionExpr(), emitOutlinedFunctionPrologue(), emitParallelOrTeamsOutlinedFunction(), clang::CodeGen::CodeGenFunction::EmitPointerWithAlignment(), clang::CodeGen::CodeGenFunction::EmitStoreThroughGlobalRegLValue(), EmitX86_64VAArgFromMemory(), clang::ento::SValBuilder::evalCast(), EvaluateBuiltinConstantP(), EvaluateComparisonBinaryOperator(), EvaluateObjectArgument(), EvaluatePointer(), EvaluateUnaryTypeTrait(), ExprLooksBoolean(), clang::analyze_printf::PrintfSpecifier::fixType(), clang::analyze_scanf::ScanfSpecifier::fixType(), GeneralizeType(), getAArch64LS(), getAArch64PBV(), clang::QualType::getBaseTypeIdentifier(), getCanonicalParamType(), clang::CodeGen::CodeGenModule::GetConstantArrayFromStringLiteral(), getCoreType(), clang::CXXDeleteExpr::getDestroyedType(), clang::CXXInstanceCall::getExtraInvalidatedValues(), clang::UserDefinedLiteral::getLiteralOperatorKind(), getObjCBridgeAttr(), clang::ASTContext::getObjCGCAttrKind(), getUuidAttrOfType(), handleObjCGCTypeAttr(), handleObjCOwnershipTypeAttr(), clang::Sema::handlerCanCatch(), clang::ASTContext::hasUniqueObjectRepresentations(), identifyCall(), IgnoreNoopCastsSingleStep(), isAutoCastType(), isConsumableType(), isIntegerLikeType(), isLibstdcxxPointerReturnFalseHack(), clang::BinaryOperator::isNullPointerArithmeticExtension(), clang::Expr::isOBJCGCCandidate(), isOSObjectRelated(), isPointerOrRef(), isRecordWithSSEVectorType(), IsTypeModifiable(), isValidBaseType(), isValidOrderingForOp(), IsVoidStarType(), loadToBegin(), LookThroughTransitiveAssignmentsAndCommaOperators(), MakeBinaryAtomicValue(), clang::analyze_format_string::ArgType::matchesType(), objectifyExpr(), peelOffPointerArithmetic(), clang::Sema::PerformImplicitConversion(), clang::Sema::PrepareCastToObjCObjectPointer(), ResolveOverloadForDeduction(), SemaBuiltinLaunder(), SemaOpenCLBuiltinEnqueueKernel(), setObjCGCLValueClass(), clang::CodeGen::CodeGenFunction::StartFunction(), TryConstCast(), TryReinterpretCast(), and TypeIsInnerPointer(). More type predicates useful for type checking/promotion. Definition at line 2533 of file Type.cpp. Referenced by addBaseAndFieldSizes(), checkArithmeticOrEnumeralThreeWayCompare(), checkVAStartIsInVariadicFunction(), clang::ento::SMTConv::doIntTypeConversion(), clang::ASTContext::getPromotedIntegerType(), GetX86_64ByValArgumentPair(), isArithmeticArgumentPromotion(), clang::Sema::IsIntegralPromotion(), isOverflowingIntegerType(), isRecordWithSSEVectorType(), clang::analyze_format_string::ArgType::matchesType(), and clang::ASTContext::mergeFunctionTypes(). Definition at line 6478 of file Type.h. Referenced by IsStandardConversion(), SemaOpenCLBuiltinEnqueueKernel(), clang::CodeGen::CodeGenFunction::ShouldNullCheckClassCastValue(), and TryOCLZeroOpaqueTypeInitialization(). Definition at line 1959 of file Type.cpp. Referenced by clang::Sema::BuildExtVectorType(), clang::Sema::BuildVectorType(), clang::ento::SMTConstraintManager::canReasonAbout(), createBinOpInfoFromIncDec(), DiagnoseBadFunctionCast(), clang::ento::SMTConv::doFloatTypeConversion(), clang::ento::SMTConv::doTypeConversion(), emitReplacement(), Evaluate(), EvaluateComparisonBinaryOperator(), EvaluateComplex(), EvaluateFloat(), EvaluateVector(), clang::analyze_printf::PrintfSpecifier::fixType(), clang::analyze_scanf::ScanfSpecifier::fixType(), clang::ento::SMTConv::fromCast(), getAbsoluteValueKind(), clang::ento::SMTConv::getBinExpr(), clang::ASTContext::getFloatingTypeOfSizeWithinDomain(), getIncrementedVar(), GetIntrinsic(), clang::StandardConversionSequence::getNarrowingKind(), clang::ento::SMTConstraintManager::getSymVal(), clang::ento::SMTConv::getZeroExpr(), isIntegerLikeType(), IsStandardConversion(), clang::ento::SMTConv::mkSort(), OpenCLArithmeticConversions(), clang::Sema::PerformImplicitConversion(), tryGCCVectorConvertAndSplat(), TryStaticCast(), and tryVectorConvertAndSplat(). Definition at line 1965 of file Type.cpp. Referenced by breakDownVectorType(), and rewriteToObjCProperty(). Definition at line 6381 of file Type.h. Referenced by clang::Sema::ActOnDependentMemberExpr(), clang::Sema::ActOnPseudoDestructorExpr(), clang::Sema::ActOnStartCXXMemberReference(), clang::Sema::BuildAnonymousStructUnionMemberReference(), clang::Sema::BuildBaseInitializer(), BuildImplicitMemberInitializer(), clang::Sema::BuildMemberPointerType(), buildMemcpyForAssignmentOp(), clang::Sema::BuildOverloadedArrowExpr(), checkFoundationAPI(), CheckMoveOnConstruction(), CheckObjCCollectionLiteralElement(), clang::Sema::CheckOverloadedOperatorDeclaration(), clang::Sema::CheckSingleAssignmentConstraints(), clang::Sema::CheckSpecifiedExceptionType(), clang::Sema::checkVariadicArgument(), ClassifyTemporary(), classifyTypeForARCConversion(), clang::Sema::CollectIvarsToConstructOrDestruct(), clang::CXXBindTemporaryExpr::Create(), clang::Sema::CXXCheckConditionalOperands(), clang::Sema::DefineImplicitCopyAssignment(), clang::Sema::DefineImplicitMoveAssignment(), DiagnoseRecursiveConstFields(), DiagnoseReinterpretUpDownCast(), clang::CodeGen::CodeGenFunction::EmitAutoVarAlloca(), clang::CodeGen::CodeGenFunction::EmitDynamicCast(), Evaluate(), evaluateCDTSize(), EvaluateInPlace(), EvaluateRecord(), EvaluateTemporary(), FastEvaluateAsRValue(), clang::Sema::FindAllocationFunctions(), FindConversionForRefInit(), findSubobject(), clang::ento::FindUninitializedFields::FindUninitializedFields(), clang::CodeGen::CodeGenFunction::GenerateObjCAtomicGetterCopyHelperFunction(), clang::CodeGen::CodeGenFunction::GenerateObjCAtomicSetterCopyHelperFunction(), getAccessFlag(), clang::QualType::getBaseTypeIdentifier(), clang::ASTContext::getByrefLifetime(), clang::CXXMethodDecl::getDevirtualizedMethod(), GetGCAttrTypeForType(), getSelfInitExpr(), GetX86_64ByValArgumentPair(), HandleConstructorCall(), clang::Sema::handlerCanCatch(), clang::ASTContext::hasUniqueObjectRepresentations(), InitCatchParam(), isCARCBridgableType(), clang::ento::NonLoc::isCompoundType(), clang::Expr::isConstantInitializer(), clang::Sema::isCopyElisionCandidate(), isImplicitThis(), clang::CodeGen::CodeGenModule::isInSanitizerBlacklist(), isObjCReceiverType(), isPointerToConst(), isRecordType(), isSimpleZero(), IsStandardConversion(), isTrackedVar(), LookupMemberExpr(), LookupMethodInReceiverType(), clang::ento::SValBuilder::makeZeroVal(), clang::Sema::PerformImplicitConversion(), ResolveOverloadedFunctionForReferenceBinding(), setObjCGCLValueClass(), clang::Expr::skipRValueSubobjectAdjustments(), clang::TreeTransform< Derived >::TransformNestedNameSpecifierLoc(), TryAddressSpaceCast(), TryConstCast(), clang::CodeGen::ConstantEmitter::tryEmitPrivateForVarInit(), TryListConversion(), TryListInitialization(), TryObjectArgumentInitialization(), TryReferenceInit(), TryReferenceInitializationCore(), TryStaticImplicitCast(), TryUserDefinedConversion(), clang::ento::ExprEngine::VisitInitListExpr(), warnAboutAmbiguousFunction(), and warnAboutRedundantParens(). Definition at line 6320 of file Type.h. Referenced by clang::CodeGen::CGOpenMPRuntimeNVPTX::adjustTargetSpecificDataForLambdas(), applyBitwiseConstraints(), clang::Sema::BuildArrayType(), clang::Sema::BuildAtomicType(), BuildImplicitMemberInitializer(), clang::Sema::BuildMemberPointerType(), clang::Sema::BuildPointerType(), clang::Sema::BuildQualifiedType(), clang::canDynamicCastThrow(), clang::CapturedStmt::Capture::Capture(), CastsAwayConstness(), castToBase(), clang::Sema::CheckAllocatedType(), clang::Sema::checkAllowedCUDAInitializer(), CheckForReference(), clang::Sema::checkInitializerLifetime(), CheckLValueConstantExpression(), checkMapClauseExpressionBase(), clang::Sema::CheckNonTypeTemplateParameterType(), clang::Sema::CheckOpenMPLinearDecl(), CheckTemplateArgumentAddressOfObjectOrFunction(), CheckTemplateArgumentIsCompatibleWithParameter(), clang::Sema::CheckUnaryExprOrTypeTraitOperand(), checkVAStartIsInVariadicFunction(), ClassifyDiagnostic(), clang::Sema::CompareReferenceRelationship(), createObjCPropertyGetter(), decomposeTypeForEH(), describeUninitializedArgumentInCall(), DiagnoseForRangeReferenceVariableCopies(), DiagnoseForRangeVariableCopies(), diagnoseListInit(), DiagnoseUninitializedReference(), DoMarkVarDeclReferenced(), clang::ento::SMTConv::doTypeConversion(), clang::CodeGen::CodeGenFunction::EmitCallArg(), clang::CodeGen::CodeGenFunction::EmitCallExprLValue(), clang::CodeGen::CodeGenFunction::EmitConstructorBody(), clang::CodeGen::CodeGenFunction::EmitCXXGlobalVarDeclInit(), EmitDeclInit(), clang::CodeGen::CodeGenFunction::EmitDeclRefLValue(), clang::CodeGen::CodeGenFunction::EmitDelegateCallArg(), clang::CodeGen::CodeGenFunction::EmitExprAsInit(), EmitGlobalVarDeclLValue(), clang::CodeGen::CodeGenFunction::EmitLValueForField(), clang::CodeGen::CodeGenFunction::EmitLValueForFieldInitialization(), clang::CodeGen::CodeGenFunction::EmitObjCMessageExprLValue(), clang::CodeGen::CodeGenFunction::EmitOMPFirstprivateClause(), emitOutlinedFunctionPrologue(), emitRTtypeidCall(), clang::CodeGen::CodeGenFunction::EmitRValueForField(), clang::ento::SValBuilder::evalCast(), clang::Expr::EvaluateAsInitializer(), EvaluateLValue(), evaluateTypeTrait(), EvaluateUnaryTypeTrait(), clang::ento::SMTConv::fromCast(), clang::CodeGen::CodeGenFunction::generateObjCGetterBody(), getBadTypeidFn(), clang::QualType::getBaseTypeIdentifier(), getCoreType(), clang::CFGImplicitDtor::getDestructorDecl(), clang::CodeGen::CGOpenMPRuntimeNVPTX::getParameterAddress(), getReferenceInitTemporaryType(), getStaticBooleanValue(), getThreadLocalWrapperLinkage(), getUuidAttrOfType(), clang::ento::SMTConv::getZeroExpr(), HandleConstructorCall(), clang::InitializationSequence::InitializeFrom(), clang::TemplateDeclInstantiator::InstantiateTypedefNameDecl(), isAutoCastType(), isCallback(), isConstantEmittableObjectType(), isConsumableType(), clang::ento::isDereferencableType(), isLiteralType(), clang::ento::Loc::isLocType(), isPointerOrRef(), isRecordEmpty(), isRecordWithSSEVectorType(), clang::FunctionDecl::isReplaceableGlobalAllocationFunction(), isSimpleZero(), clang::CodeGen::CodeGenModule::isTypeConstant(), clang::Expr::isUnusedResultAWarning(), isValidBaseType(), loadToBegin(), clang::CodeGen::CodeGenModule::maybeSetTrivialComdat(), clang::InitializationSequence::Perform(), clang::Sema::PerformImplicitConversion(), PerformReturnAdjustment(), print_elem(), clang::APValue::printPretty(), clang::ento::ExprEngine::ProcessAutomaticObjDtor(), clang::ento::ExprEngine::ProcessInitializer(), clang::TreeTransform< Derived >::RebuildQualifiedType(), clang::ReferenceType::ReferenceType(), clang::Expr::setType(), clang::CodeGen::CodeGenFunction::OMPMapVars::setVarAddr(), supportsNilWithFloatRet(), clang::CodeGen::CGOpenMPRuntimeNVPTX::translateParameter(), TryCopyInitialization(), clang::CodeGen::ConstantEmitter::tryEmitPrivate(), clang::CodeGen::ConstantEmitter::tryEmitPrivateForVarInit(), TryListConversion(), TryListInitialization(), TryReferenceInit(), TryStaticImplicitCast(), TryUserDefinedConversion(), clang::FunctionCallFilterCCC::ValidateCandidate(), clang::ento::ExprEngine::VisitCast(), visitLocalsRetainedByInitializer(), clang::consumed::ConsumedStmtVisitor::VisitParmVarDecl(), warnAboutAmbiguousFunction(), wasRegionOfInterestModifiedAt(), and writeShouldKill(). Definition at line 6482 of file Type.h. Referenced by SemaBuiltinCommitRWPipe(), and SemaBuiltinRWPipe(). Definition at line 6328 of file Type.h. Referenced by clang::ExprWithCleanups::Create(), EvaluateUnaryTypeTrait(), FindConversionForRefInit(), clang::UserDefinedLiteral::getUDSuffix(), clang::ento::ExprEngine::handleLValueBitCast(), isRValueRef(), RefersToRValueRef(), TryListConversion(), TryReferenceInit(), TryReferenceListInitialization(), and TryStaticReferenceDowncast(). Definition at line 6466 of file Type.h. Referenced by clang::Sema::CreateBuiltinBinOp(), clang::Sema::CreateBuiltinUnaryOp(), clang::CodeGen::CodeGenFunction::EmitVarDecl(), clang::CodeGen::CodeGenModule::maybeSetTrivialComdat(), and TryOCLSamplerInitialization(). Return true if this is a saturated fixed point type according to ISO/IEC JTC1 SC22 WG14 N1169. This type can be signed or unsigned. Definition at line 6619 of file Type.h. Referenced by clang::ASTContext::getCorrespondingSaturatedType(), clang::ASTContext::getFixedPointSemantics(), and handleFixedPointConversion(). Definition at line 6649 of file Type.h. Referenced by clang::Sema::ActOnOpenMPAtomicDirective(), clang::Sema::areLaxCompatibleVectorTypes(), breakDownVectorType(), clang::Sema::BuildPseudoDestructorExpr(), canRecoverDotPseudoDestructorCallsOnPointerObjects(), clang::CapturedStmt::Capture::Capture(), clang::Sema::CheckBooleanCondition(), checkCondition(), DiagnoseBadFunctionCast(), DiagnoseNullConversion(), EvaluateUnaryTypeTrait(), getExistingLazyBinding(), clang::Sema::getFixItZeroInitializerForType(), getScalarTypeKind(), clang::ento::BasicValueFactory::getZeroWithTypeSize(), hasIsEqualMethod(), clang::QualType::isCXX11PODType(), isLiteralType(), isRecordEmpty(), isStandardLayoutType(), isTrackedVar(), clang::QualType::isTriviallyCopyableType(), clang::QualType::isTrivialType(), LookThroughTransitiveAssignmentsAndCommaOperators(), matchTypes(), clang::Sema::setOpenMPCaptureKind(), and TryListInitialization(). Determine whether this type is a scoped enumeration type. Definition at line 492 of file Type.cpp. Return true if this is a fixed point type that is signed according to ISO/IEC JTC1 SC22 WG14 N1169. This type can also be saturated. Definition at line 6631 of file Type.h. Referenced by clang::ASTContext::getCorrespondingUnsignedType(), clang::ASTContext::getFixedPointSemantics(), and handleFixedPointConversion(). Determines whether this is an integer type that is signed or an enumeration types whose underlying type is a signed integer type. Definition at line 1882 of file Type.cpp. Referenced by applyBitwiseConstraints(), assumeNoOverflow(), clang::ento::SMTConv::castAPSInt(), CheckICE(), CheckImplicitConversion(), createBinOpInfoFromIncDec(), clang::ento::SMTConv::doIntTypeConversion(), clang::CodeGen::CodeGenFunction::EmitArraySubscriptExpr(), EmitCXXNewAllocSize(), EmitIntegerSignChangeCheckHelper(), EmitIntegerTruncationCheckHelper(), emitPointerArithmetic(), EvaluateComparisonBinaryOperator(), EvaluateFixedPointOrInteger(), clang::ento::SMTConv::fromCast(), clang::ento::BasicValueFactory::getAPSIntType(), clang::ento::SMTConv::getBinExpr(), clang::StandardConversionSequence::getNarrowingKind(), clang::ento::SMTConv::getRangeExpr(), clang::ento::SMTConstraintManager::getSymVal(), clang::ento::SMTConv::getZeroExpr(), HandleFloatToIntCast(), hasSignedIntegerRepresentation(), isWithinConstantOverflowBounds(), clang::ASTContext::MakeIntValue(), clang::CodeGen::CodeGenFunction::ShouldNullCheckClassCastValue(), tryEvaluateBuiltinObjectSize(), and tryRearrange(). Return true if this is an integer type that is signed, according to C99 6.2.5p4 [char, signed char, short, int, long..], or an enum decl which has a signed representation. Definition at line 1866 of file Type.cpp. Referenced by AnalyzeBitFieldAssignment(), CheckImplicitConversion(), EmitAtomicOp(), clang::CodeGen::CodeGenFunction::EmitCheckTypeDescriptor(), EvaluateUnaryTypeTrait(), EvaluateVector(), clang::analyze_printf::PrintfSpecifier::fixType(), clang::analyze_scanf::ScanfSpecifier::fixType(), clang::ASTContext::getFixedPointSemantics(), getIntegerWidthAndSignedness(), clang::ASTContext::getPromotedIntegerType(), hasDefaultSetterName(), clang::Sema::IsIntegralPromotion(), isKnownToHaveUnsignedValue(), clang::ASTContext::isPromotableBitField(), printExprAsWritten(), rewriteToNumericBoxedExpression(), and clang::TextNodeDumper::VisitIntegerLiteral(). Test for a particular builtin type. Definition at line 6527 of file Type.h. Referenced by clang::ento::SMTConstraintManager::canReasonAbout(), CheckImplicitConversion(), clang::Sema::CheckLiteralOperatorDeclaration(), clang::Sema::CheckOverloadedOperatorDeclaration(), checkVAStartIsInVariadicFunction(), DiagnoseFloatingImpCast(), clang::OverloadExpr::find(), clang::ASTContext::getOpenMPDefaultSimdAlign(), clang::ASTContext::getPreferredTypeAlign(), HandleConstructorCall(), isCharType(), isTypeSubstitutable(), and LookupMemberExpr(). Test for a specific placeholder type. Definition at line 6547 of file Type.h. Referenced by clang::Sema::ActOnOMPArraySectionExpr(), clang::Sema::BuildCoreturnStmt(), clang::canCalleeThrow(), clang::CallExpr::getCallReturnType(), and clang::ObjCPropertyRefExpr::ObjCPropertyRefExpr(). Returns true if this type can be represented by some set of type specifiers. Definition at line 2566 of file Type.cpp. Referenced by GetBaseType(), and splitAccordingToPolicy(). Test if this type is a standard-layout type. Definition at line 2430 of file Type.cpp. References getAs(), getBaseElementTypeUnsafe(), isDependentType(), isIncompleteType(), isScalarType(), and isVectorType(). Referenced by EvaluateUnaryTypeTrait(), and isLayoutCompatible(). Definition at line 2524 of file Type.cpp. Definition at line 461 of file Type.cpp. References clang::TagDecl::isClass(), clang::TagDecl::isInterface(), and clang::TagDecl::isStruct(). Referenced by buildUserDefinedMapperRef(), DereferenceInfo::DereferenceInfo(), isRecordEmpty(), and markEscapingByrefs(). Definition at line 443 of file Type.cpp. Definition at line 6523 of file Type.h. Determine whether this type is an undeduced type, meaning that it somehow involves a C++11 'auto' type or similar which has not yet been deduced. Definition at line 6683 of file Type.h. Referenced by clang::Sema::ActOnExplicitInstantiation(), clang::Sema::ActOnFinishFunctionBody(), clang::Sema::ActOnUninitializedDecl(), clang::Sema::AddInitializerToDecl(), clang::Sema::canDelayFunctionBody(), clang::Sema::CheckNonTypeTemplateParameterType(), clang::Sema::CheckTemplateArgument(), clang::Sema::CheckVariableDeclarationType(), completeFunctionType(), clang::Sema::deduceClosureReturnType(), clang::Sema::DeduceReturnType(), clang::Sema::DefineImplicitLambdaToFunctionPointerConversion(), FinishForRangeVarDecl(), GetTypeOfFunction(), handleObjCOwnershipTypeAttr(), hasDeducedReturnType(), and clang::Sema::MergeVarDeclTypes(). Definition at line 475 of file Type.cpp. Referenced by appendRecordType(), buildUserDefinedMapperRef(), CheckConstexprCtorInitializer(), checkFoundationAPI(), checkMapClauseExpressionBase(), checkMemberDecomposition(), DereferenceInfo::DereferenceInfo(), clang::CodeGen::CGDebugInfo::EmitGlobalVariable(), evaluateCDTSize(), EvaluateUnaryTypeTrait(), clang::ento::FindUninitializedFields::FindUninitializedFields(), GetGCAttrTypeForType(), GetX86_64ByValArgumentPair(), and isRecordEmpty(). Definition at line 6627 of file Type.h. Return true if this is a fixed point type that is unsigned according to ISO/IEC JTC1 SC22 WG14 N1169. Definition at line 6645 of file Type.h. Referenced by clang::ASTContext::getCorrespondingSignedFixedPointType(), and handleFixedPointConversion(). Determines whether this is an integer type that is unsigned or an enumeration types whose underlying type is a unsigned integer type. Definition at line 1922 of file Type.cpp. Referenced by clang::ento::BasicValueFactory::getTruthValue(), getTypeString(), GetValueRange(), HandleIntToIntCast(), hasUnsignedIntegerRepresentation(), and clang::ento::SValBuilder::makeIntVal(). Return true if this is an integer type that is unsigned, according to C99 6.2.5p6 [which returns true for _Bool], or an enum decl which has an unsigned representation. Definition at line 1906 of file Type.cpp. Referenced by applyBitwiseConstraints(), CheckImplicitConversion(), createBinOpInfoFromIncDec(), clang::ento::SValBuilder::evalIntegralCast(), EvaluateUnaryTypeTrait(), clang::analyze_printf::PrintfSpecifier::fixType(), clang::analyze_scanf::ScanfSpecifier::fixType(), clang::ASTContext::getIntegerTypeOrder(), clang::ASTContext::getPromotedIntegerType(), IsStdFunction(), SemaBuiltinReserveRWPipe(), and SemaBuiltinRWPipe(). Definition at line 6369 of file Type.h. Referenced by CheckICE(), clang::Sema::CreateUnaryExprOrTypeTraitExpr(), clang::CodeGen::CodeGenFunction::EmitArrayToPointerDecay(), emitOMPArraySectionBase(), clang::ento::SValBuilder::evalCast(), isLiteralType(), isSimpleArrayDecayOperand(), clang::ento::ExprEngine::VisitUnaryExprOrTypeTraitExpr(), and writeShouldKill(). Whether this type is a variably-modified type (C99 6.7.5). Definition at line 2104 of file Type.h. Referenced by clang::Sema::ActOnOpenMPCopyprivateClause(), clang::Sema::ActOnOpenMPPrivateClause(), clang::Sema::CheckAllocatedType(), clang::Sema::CheckNonTypeTemplateParameterType(), clang::Sema::CheckTemplateArgument(), clang::Sema::CreateUnaryExprOrTypeTraitExpr(), diagnoseArrayStarInParamType(), clang::CodeGen::CodeGenFunction::EmitAutoVarAlloca(), clang::CodeGen::CGOpenMPRuntime::emitCall(), clang::CodeGen::CodeGenFunction::EmitCompoundLiteralLValue(), clang::CodeGen::CodeGenModule::EmitExplicitCastExprType(), emitOutlinedFunctionPrologue(), emitReductionCombiner(), clang::CodeGen::CodeGenFunction::EmitStaticVarDecl(), clang::CodeGen::CodeGenFunction::EmitVariablyModifiedType(), clang::FunctionType::getNameForCallConv(), clang::ASTContext::getVariableArrayDecayedType(), clang::Sema::HandleExprEvaluationContextForTypeof(), hasSizedVLAType(), clang::TemplateDeclInstantiator::InstantiateTypedefNameDecl(), clang::QualType::isCanonicalAsParam(), isCheapEnoughToEvaluateUnconditionally(), isObjCClassOrClassKindOfType(), NeedsInstantiationAsFunctionType(), clang::DependentSizedArrayType::Profile(), clang::DependentSizedExtVectorType::Profile(), clang::DependentVectorType::Profile(), clang::CodeGen::CodeGenFunction::StartFunction(), clang::Sema::SubstType(), clang::Sema::tryCaptureVariable(), clang::TextNodeDumper::Visit(), and clang::TemplateDeclInstantiator::VisitVarDecl(). Definition at line 6393 of file Type.h. Referenced by clang::Sema::ActOnCastExpr(), clang::ASTContext::areCompatibleVectorTypes(), clang::Sema::areLaxCompatibleVectorTypes(), clang::Sema::BuildPseudoDestructorExpr(), clang::Sema::BuildVectorLiteral(), canRecoverDotPseudoDestructorCallsOnPointerObjects(), checkFoundationAPI(), checkObjCMethodX86VectorTypes(), clang::Sema::CheckVectorCast(), createBinOpInfoFromIncDec(), clang::Sema::CXXCheckConditionalOperands(), DiagnoseBadFunctionCast(), clang::CodeGen::CodeGenFunction::EmitArraySubscriptExpr(), clang::CodeGen::CodeGenFunction::EmitExtVectorElementExpr(), clang::CodeGen::CodeGenFunction::EmitLoadOfScalar(), clang::CodeGen::CodeGenFunction::EmitLValueForField(), clang::CodeGen::CodeGenFunction::EmitStoreOfScalar(), EmitX86_64VAArgFromMemory(), Evaluate(), EvaluateComparisonBinaryOperator(), EvaluateLValue(), EvaluateUnaryTypeTrait(), EvaluateVector(), GetIntrinsic(), getTypeString(), clang::Sema::InvalidLogicalVectorOperands(), isCheapEnoughToEvaluateUnconditionally(), clang::ento::NonLoc::isCompoundType(), clang::QualType::isCXX11PODType(), clang::CodeGen::ABIInfo::isHomogeneousAggregate(), isIntegerLikeType(), clang::Sema::isLaxVectorConversion(), isLiteralType(), isRecordEmpty(), isRecordWithSSEVectorType(), isStandardLayoutType(), isTrackedVar(), clang::QualType::isTriviallyCopyableType(), clang::QualType::isTrivialType(), IsVectorConversion(), clang::ento::SValBuilder::makeZeroVal(), clang::Expr::refersToVectorElement(), rewriteInputConstraintReferences(), clang::Sema::SemaBuiltinShuffleVector(), clang::Sema::SemaConvertVectorExpr(), TryReinterpretCast(), clang::ento::ExprEngine::VisitArraySubscriptExpr(), clang::ento::ExprEngine::VisitInitListExpr(), and clang::ento::ExprEngine::VisitLogicalExpr(). Return true if the visibility was explicitly set is the code. Definition at line 2318 of file Type.h. Definition at line 469 of file Type.cpp. Referenced by clang::CodeGen::CGDebugInfo::addHeapAllocSiteMetadata(), clang::ento::StoreManager::CastRetrievedVal(), checkConditionalBlockPointerCompatibility(), checkIntToPointerCast(), clang::Sema::CheckSubscriptingKind(), clang::ento::SMTConv::doTypeConversion(), EvaluateComparisonBinaryOperator(), EvaluatePointer(), getExistingLazyBinding(), isVoidPointer(), clang::analyze_format_string::ArgType::matchesType(), clang::ASTContext::ObjCQualifiedIdTypesAreCompatible(), and SemaBuiltinLaunder(). Definition at line 6560 of file Type.h. Referenced by clang::Sema::ActOnCastExpr(), clang::Sema::ActOnCXXDelete(), clang::Sema::ActOnObjCAtSynchronizedOperand(), clang::Sema::ActOnStartOfObjCMethodDef(), addBaseAndFieldSizes(), AnalyzeImplicitConversions(), clang::ento::StoreManager::attemptDownCast(), clang::Sema::BuildArrayType(), clang::Sema::BuildCoreturnStmt(), clang::Sema::BuildCXXTypeConstructExpr(), clang::Sema::BuildDeclarationNameExpr(), clang::Sema::buildLambdaScope(), clang::Sema::BuildMemberPointerType(), clang::Sema::BuildObjCAtThrowStmt(), clang::Sema::BuildPseudoDestructorExpr(), checkArithmeticBinOpPointerOperands(), checkArithmeticOpPointerOperand(), clang::Sema::CheckCallReturnType(), checkConditionalObjectPointersCompatibility(), clang::Sema::CheckConditionalOperands(), checkConditionalVoidType(), clang::Sema::CheckConstexprFunctionBody(), clang::Sema::CheckCXXThrowOperand(), CheckIndirectionOperand(), CheckMemaccessSize(), clang::comments::Sema::checkReturnsCommand(), clang::Sema::CheckSpecifiedExceptionType(), clang::Sema::CheckTransparentUnionArgumentConstraints(), CheckUnaryTypeTraitTypeCompleteness(), clang::Sema::checkUnknownAnyCast(), ClassifyConditional(), classifyTypeForARCConversion(), clang::CodeGen::CodeGenModule::ConstructAttributeList(), clang::Sema::CXXCheckConditionalOperands(), deduceOpenCLImplicitAddrSpace(), DiagnoseBadFunctionCast(), DiagnoseCastOfObjCSEL(), DiagnoseReinterpretUpDownCast(), clang::CodeGen::CodeGenFunction::EmitCallAndReturnForThunk(), clang::CodeGen::CodeGenFunction::EmitDynamicCast(), clang::CodeGen::CodeGenFunction::EmitInlinedInheritingCXXConstructorCall(), emitPointerArithmetic(), EmitX86_64VAArgFromMemory(), evalBinOpFieldRegionFieldRegion(), Evaluate(), EvaluateBinaryTypeTrait(), evaluateCDTSize(), EvaluateLValue(), evaluateTypeTrait(), EvaluateUnaryTypeTrait(), EvaluateVoid(), FinishForRangeVarDecl(), formatBlockPlaceholder(), clang::CodeGen::CodeGenFunction::GenerateCode(), getAArch64MTV(), getCastAwayConstnessCastKind(), getNDSWDS(), clang::ento::SMTConstraintManager::getSymVal(), getTypeString(), clang::CodeGen::CodeGenFunction::GetUndefRValue(), HandleFunctionCall(), clang::Sema::handlerCanCatch(), HandleSizeof(), IgnoreCommaOperand(), clang::Sema::IgnoredValueConversions(), clang::CXXDynamicCastExpr::isAlwaysNull(), isCARCBridgableType(), isCheapEnoughToEvaluateUnconditionally(), isDispatchBlock(), clang::CodeGen::ABIInfo::isHomogeneousAggregate(), isIncompleteType(), isLiteralType(), clang::Expr::isNullPointerConstant(), clang::ento::cocoa::isRefType(), isUnitTest(), clang::Expr::isUnusedResultAWarning(), IsValidIdentifier(), clang::ento::SymExpr::isValidTypeForSymbol(), clang::Sema::isValidVarArgType(), isVoidPointerToNonConst(), IsVoidStarType(), clang::analyze_format_string::ArgType::matchesType(), noteMemberDeclaredHere(), clang::consumed::ConsumedAnalyzer::run(), shouldBeModeledWithNoOp(), clang::CodeGen::CodeGenFunction::ShouldNullCheckClassCastValue(), clang::CodeGen::CodeGenFunction::StartFunction(), clang::Sema::SubstParmVarDecl(), TryAddressSpaceCast(), tryGenerateSpecializedMessageSend(), TryStaticCast(), clang::ento::ExprEngine::VisitArraySubscriptExpr(), warnAboutAmbiguousFunction(), and wasRegionOfInterestModifiedAt(). Definition at line 1818 of file Type.cpp. Referenced by clang::Sema::BuildExpressionFromIntegralTemplateArgument(), clang::analyze_printf::PrintfSpecifier::fixType(), and clang::analyze_scanf::ScanfSpecifier::fixType(). Definition at line 1807 of file Type.h. Referenced by clang::TemplateSpecializationType::anyDependentTemplateArguments(), clang::TypeWithKeyword::getKeywordName(), clang::FunctionType::getNameForCallConv(), and clang::ObjCObjectType::ObjCObjectType(). Definition at line 1796 of file Type.h. Referenced by clang::FunctionType::getNameForCallConv(), and clang::ObjCObjectType::ObjCObjectType(). Definition at line 1802 of file Type.h. Referenced by clang::TemplateSpecializationType::anyDependentTemplateArguments(), clang::FunctionType::getNameForCallConv(), and clang::ObjCObjectType::ObjCObjectType(). Definition at line 1805 of file Type.h. Definition at line 1794 of file Type.h. Definition at line 1775 of file Type.h. Definition at line 1812 of file Type.h. Definition at line 1813 of file Type.h. Definition at line 1767 of file Type.h. Definition at line 1715 of file Type.h. Definition at line 1716 of file Type.h. Definition at line 1717 of file Type.h. Definition at line 1718 of file Type.h. Definition at line 1728 of file Type.h. Definition at line 1723 of file Type.h. Definition at line 1719 of file Type.h. Definition at line 1720 of file Type.h. Referenced by clang::ObjCObjectType::isSpecialized(), and clang::ObjCObjectType::ObjCObjectType(). Definition at line 1729 of file Type.h. Definition at line 1721 of file Type.h. Definition at line 1725 of file Type.h. Definition at line 1726 of file Type.h. Definition at line 1714 of file Type.h. Referenced by clang::TypePropertyCache< Private >::ensure(), clang::TypePropertyCache< Private >::get(), getLinkage(), getTypeClassName(), hasUnnamedOrLocalType(), and isLinkageValid(). Definition at line 1722 of file Type.h. Definition at line 1724 of file Type.h.